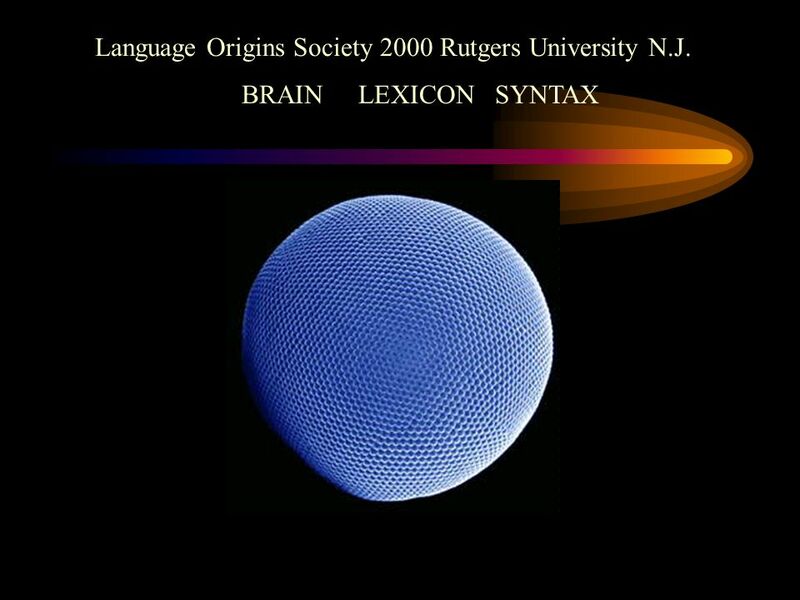 Language Origins Society 2000 Rutgers University N.J.
1 Language Origins Society 2000 Rutgers University N.J. 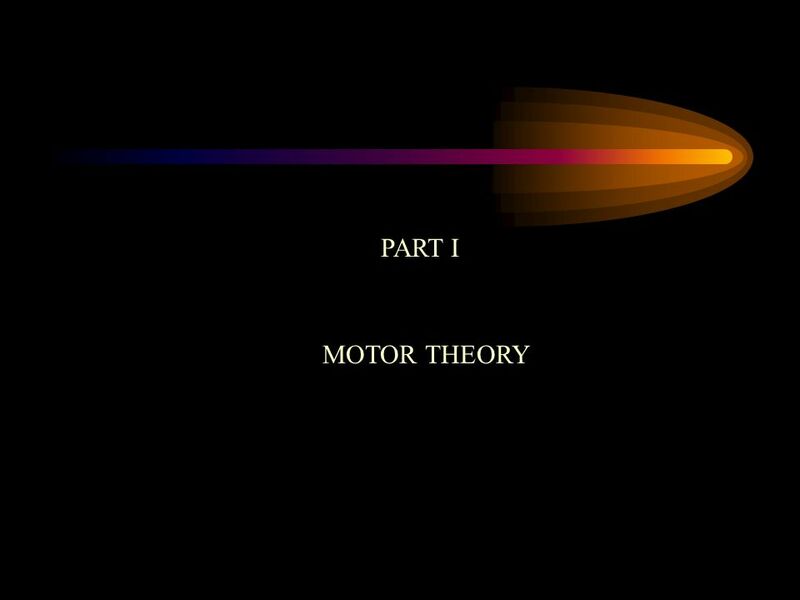 The Motor Theory is a theory of the origin and functioning of language. 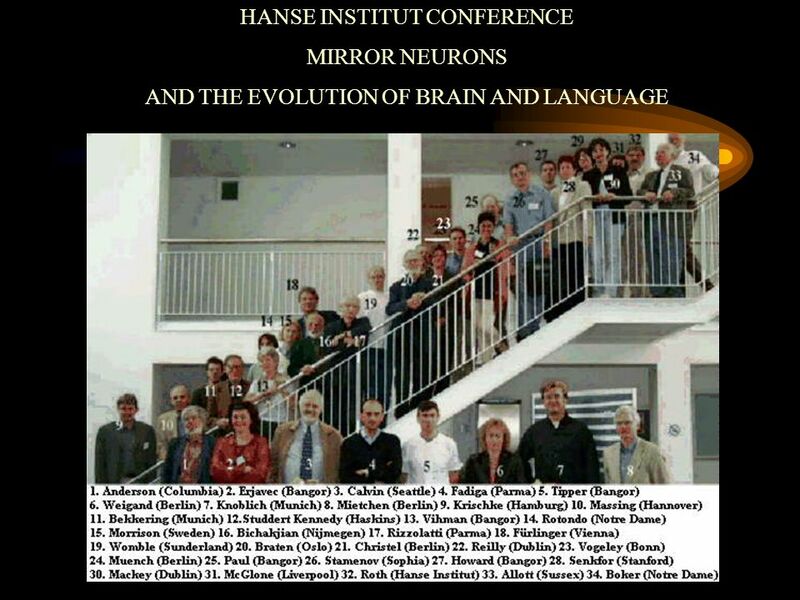 The theory is that the structures of language (phonological, lexical and syntactic) were derived from and modelled on the pre-existing complex neural systems which had evolved for the control of body movement. 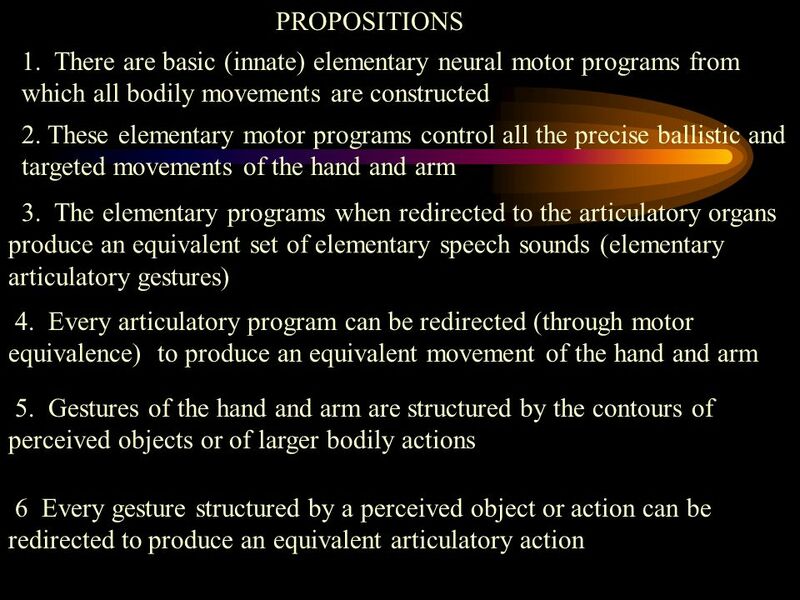 Motor control at the neural level requires pre-set elementary units of action which can be integrated into more extended patterns of bodily action -- neural motor programs. 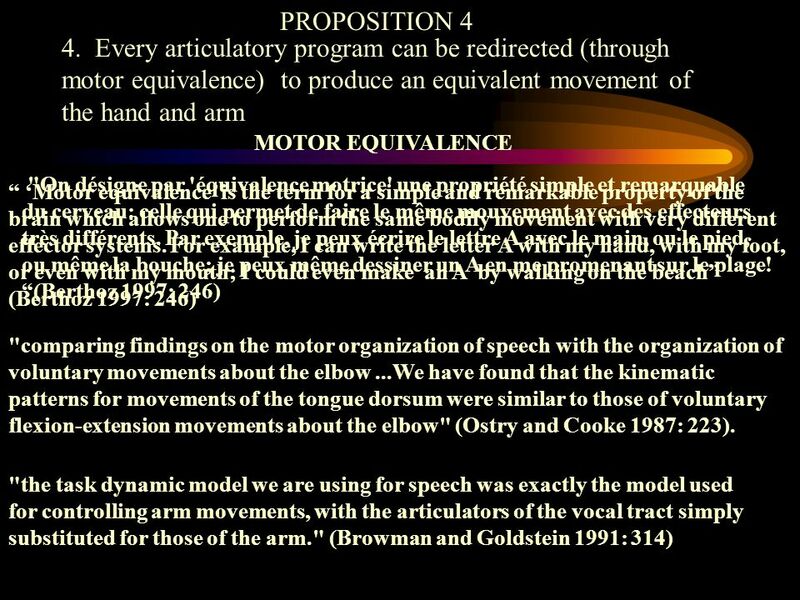 Speech is essentially a motor activity (a stream of articulatory gestures). 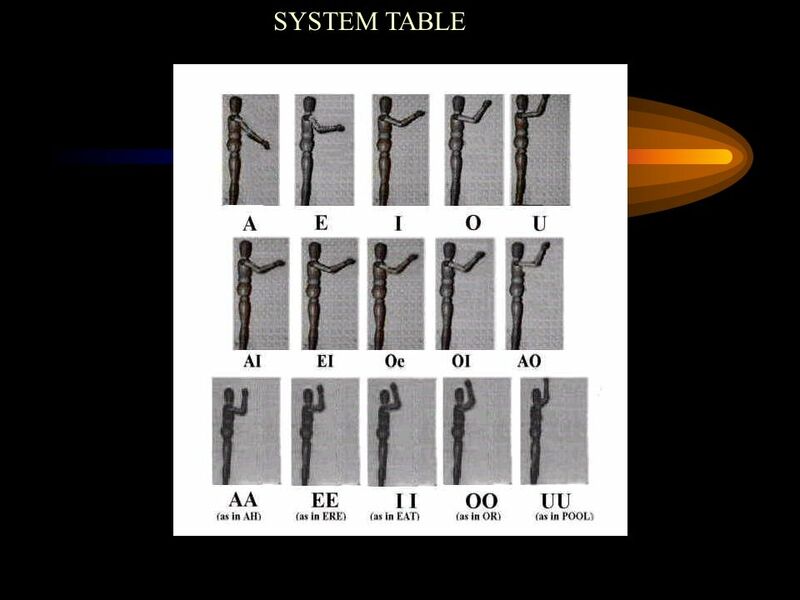 Language made use of the elementary pre-set units of motor action to produce equivalent phonological units (phonemic categories). 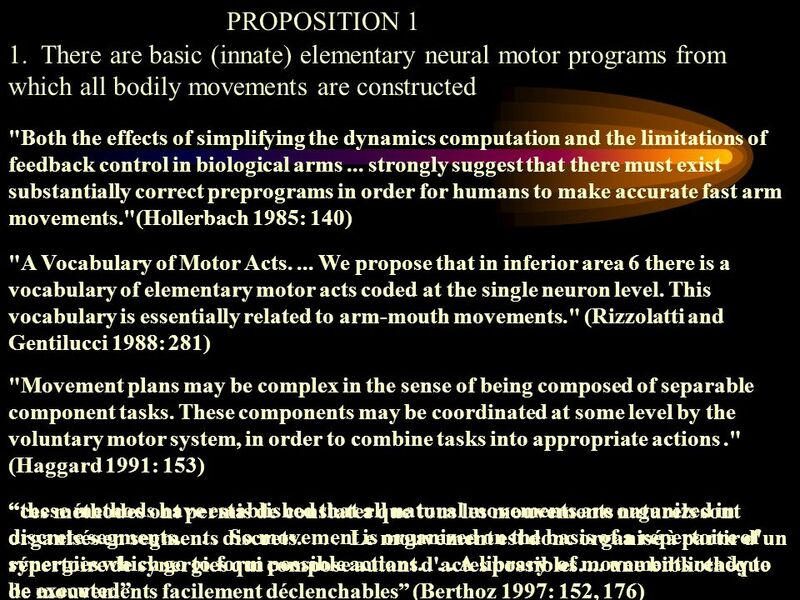 The neural programs for individual words were constructed from the elementary units in the same way as motor programs for bodily action. 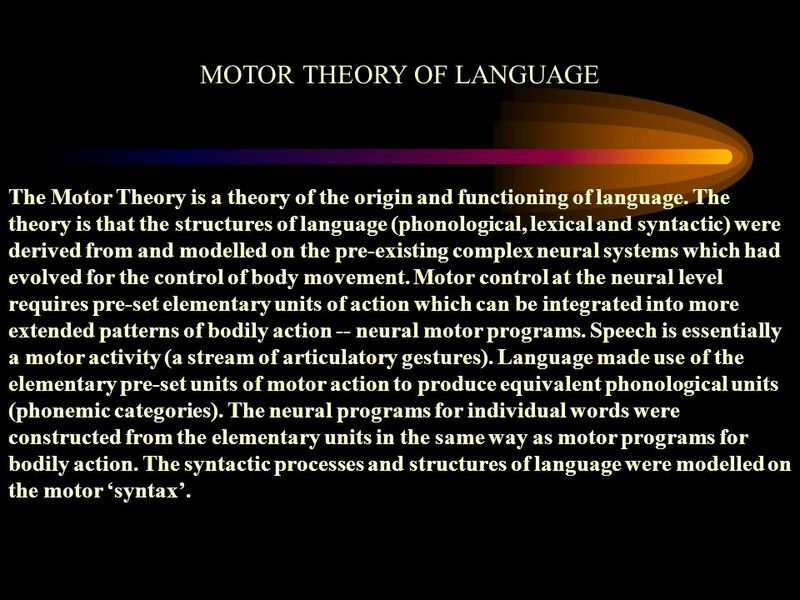 The syntactic processes and structures of language were modelled on the motor ‘syntax’. 6 PLATO in the CRATYLUS "Cratylus says that everything has a right name of its own, which comes by nature and that a name is not whatever people call a thing by agreement, just a piece of their own voice applied to the thing, but that there is a kind of inherent correctness (orthoteta tina ton onomaton pephukenai) which is the same for all men, both Greeks and foreigners" whereas Hermogenes was not persuaded that "there is any correctness of names other than convention and agreement". 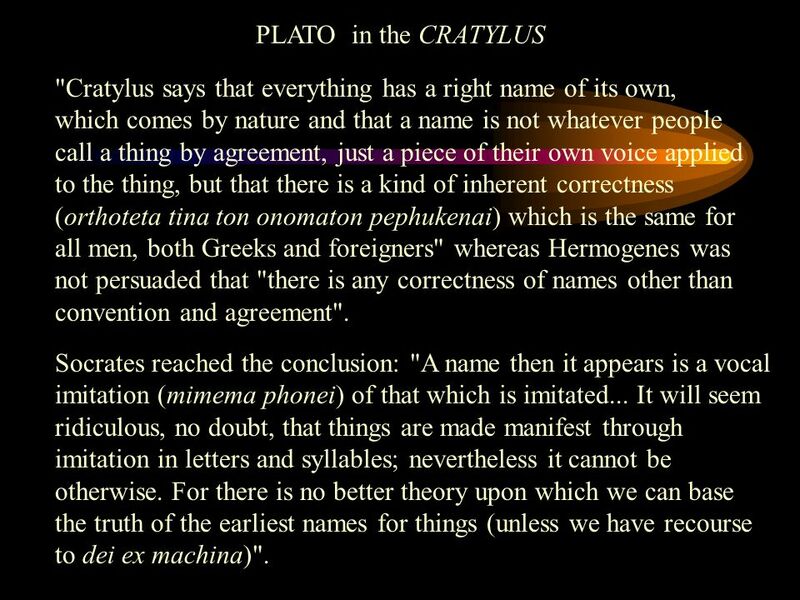 Socrates reached the conclusion: "A name then it appears is a vocal imitation (mimema phonei) of that which is imitated... It will seem ridiculous, no doubt, that things are made manifest through imitation in letters and syllables; nevertheless it cannot be otherwise. 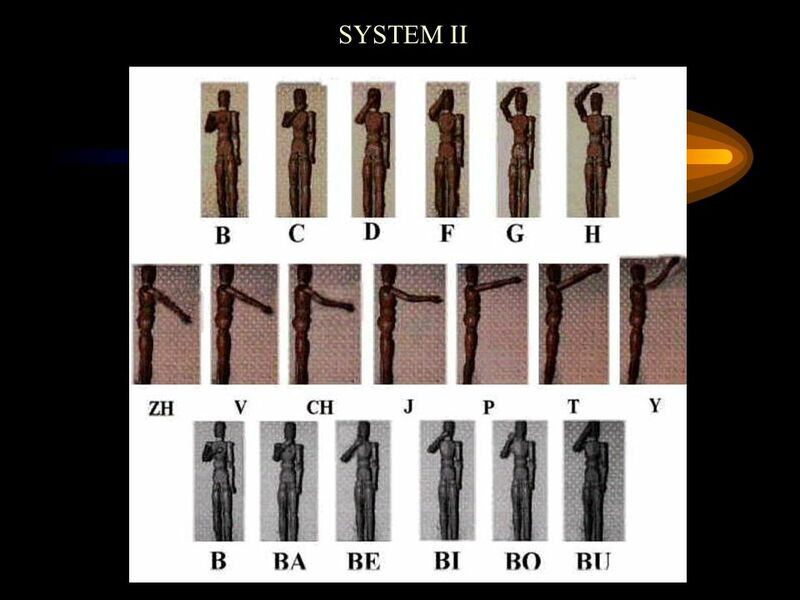 For there is no better theory upon which we can base the truth of the earliest names for things (unless we have recourse to dei ex machina)". 7 LUCRETIUS De Rerum Natura 5: "putare aliquem tum nomina distribuisse rebus et inde homines didicisse vocabula prima, desiperest. nam cur hic posset cuncta notare vocibus et varios sonitus emittere linguae tempore eodem alii id non quiesse putentur." 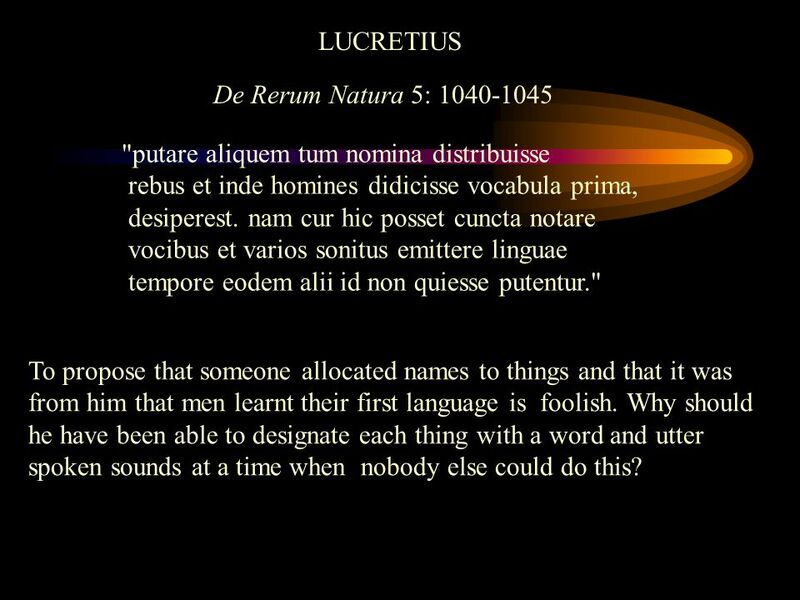 To propose that someone allocated names to things and that it was from him that men learnt their first language is foolish. 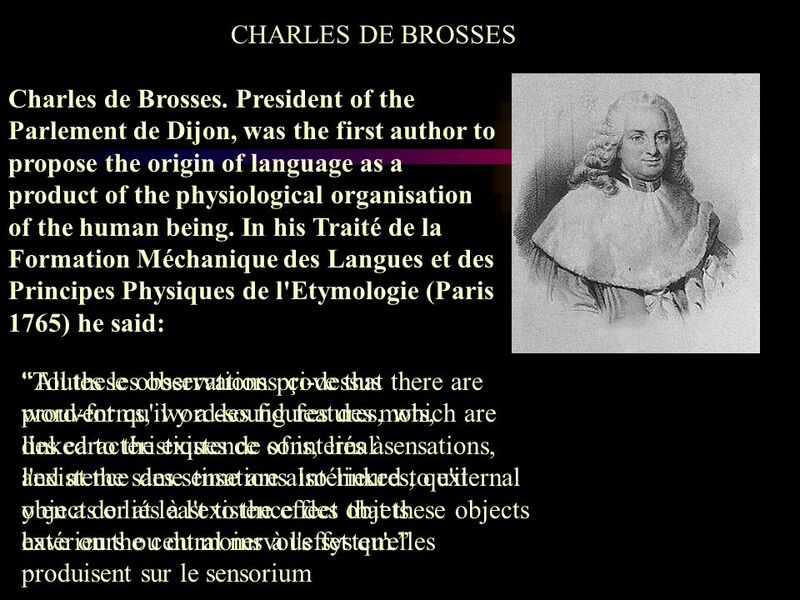 Why should he have been able to designate each thing with a word and utter spoken sounds at a time when nobody else could do this? 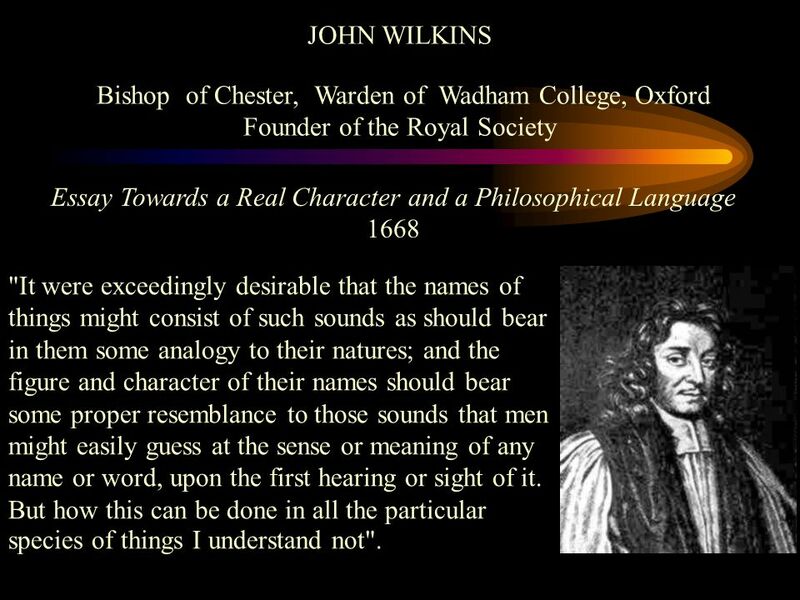 JOHN WILKINS Bishop of Chester, Warden of Wadham College, Oxford Founder of the Royal Society Essay Towards a Real Character and a Philosophical Language 1668 "It were exceedingly desirable that the names of things might consist of such sounds as should bear in them some analogy to their natures; and the figure and character of their names should bear some proper resemblance to those sounds that men might easily guess at the sense or meaning of any name or word, upon the first hearing or sight of it. 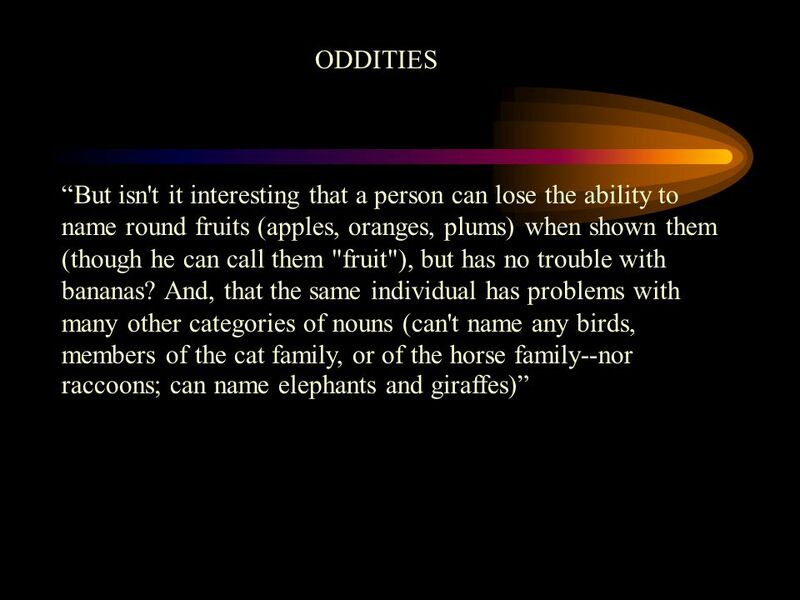 But how this can be done in all the particular species of things I understand not". 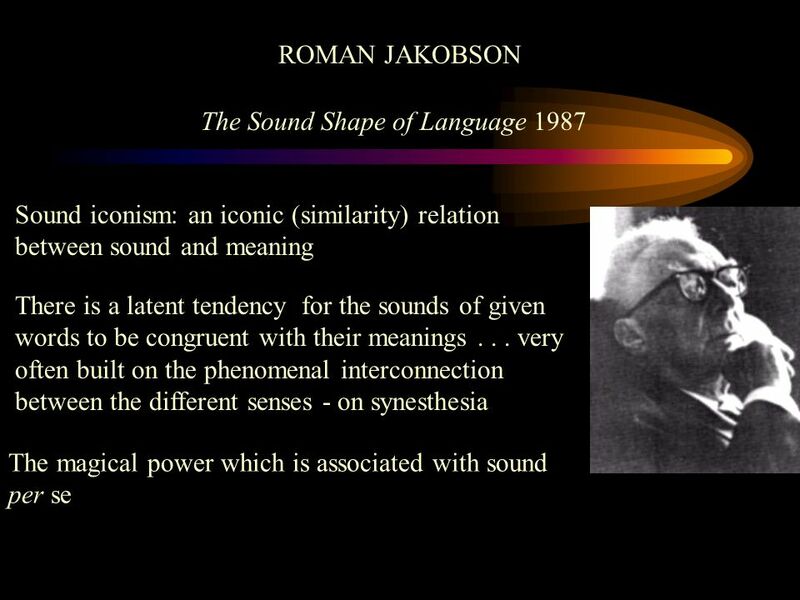 Essay on the Origin of Language 1772 Whence comes to man the art of changing into sound what is not sound? What has a color, what has roundness in common with the name that might evolve from it? The protagonists of the supernatural origin of language have their answer ready-made: "Arbitrary! 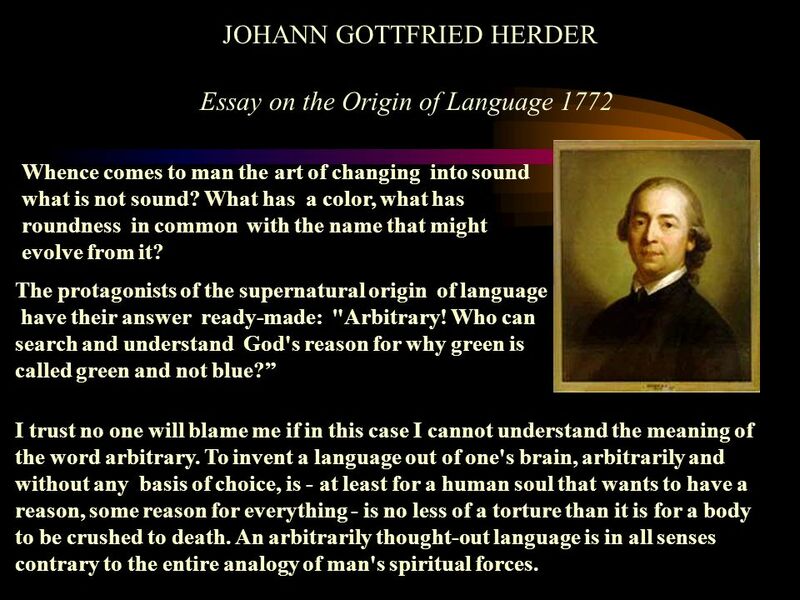 Who can search and understand God's reason for why green is called green and not blue?” I trust no one will blame me if in this case I cannot understand the meaning of the word arbitrary. To invent a language out of one's brain, arbitrarily and without any basis of choice, is - at least for a human soul that wants to have a reason, some reason for everything - is no less of a torture than it is for a body to be crushed to death. 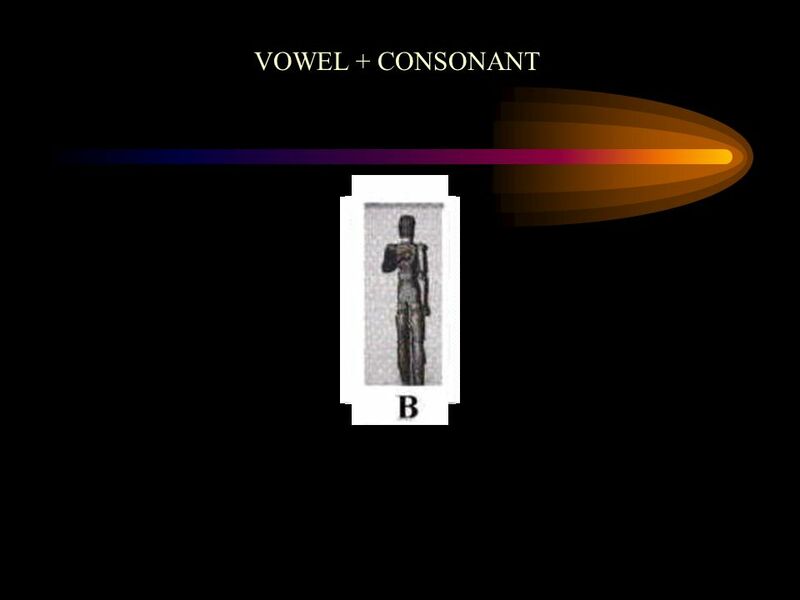 An arbitrarily thought-out language is in all senses contrary to the entire analogy of man's spiritual forces. 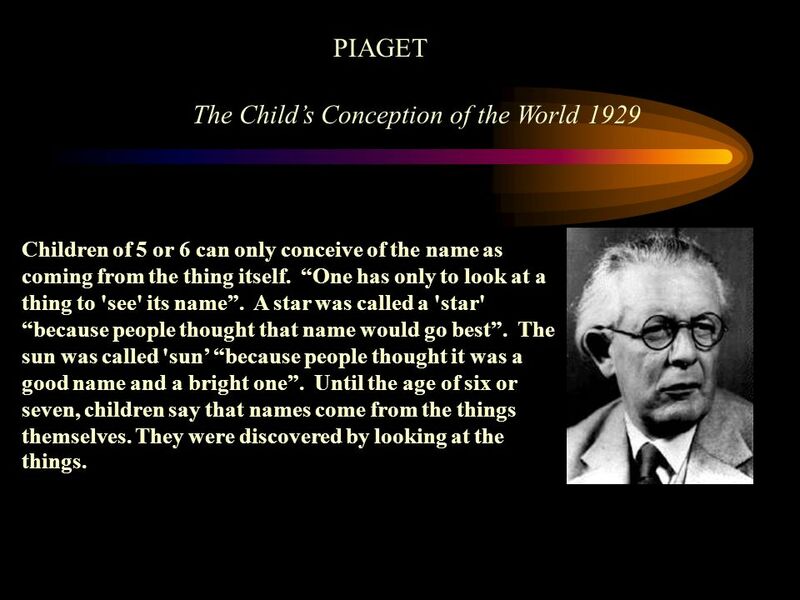 PIAGET The Child’s Conception of the World 1929 Children of 5 or 6 can only conceive of the name as coming from the thing itself. 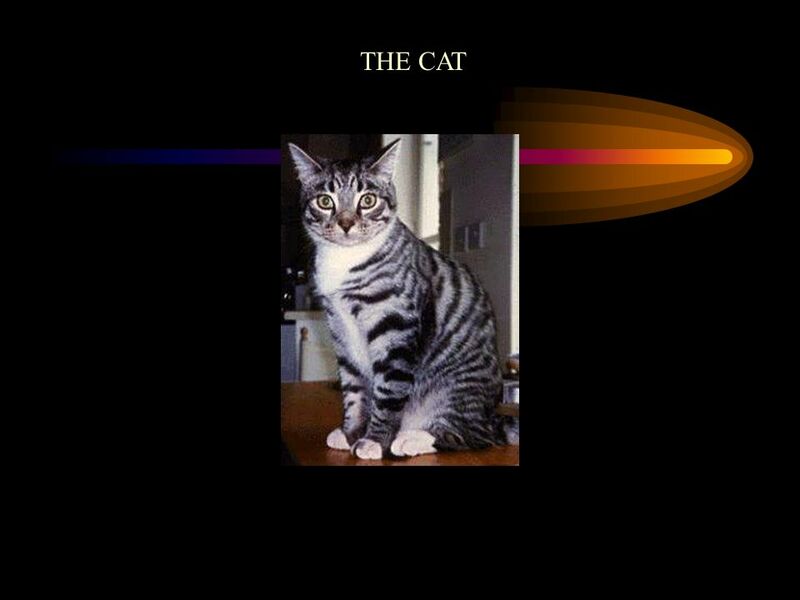 “One has only to look at a thing to 'see' its name”. A star was called a 'star' “because people thought that name would go best”. The sun was called 'sun’ “because people thought it was a good name and a bright one”. 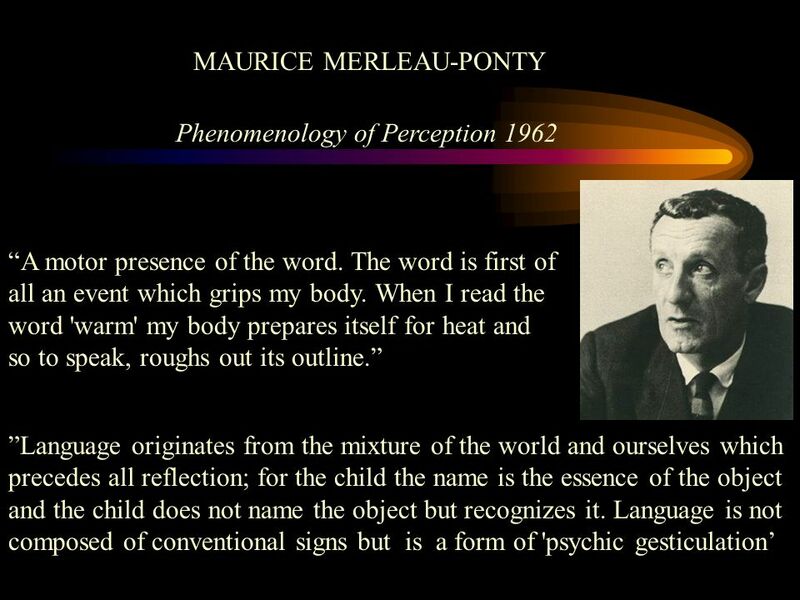 Until the age of six or seven, children say that names come from the things themselves. They were discovered by looking at the things. 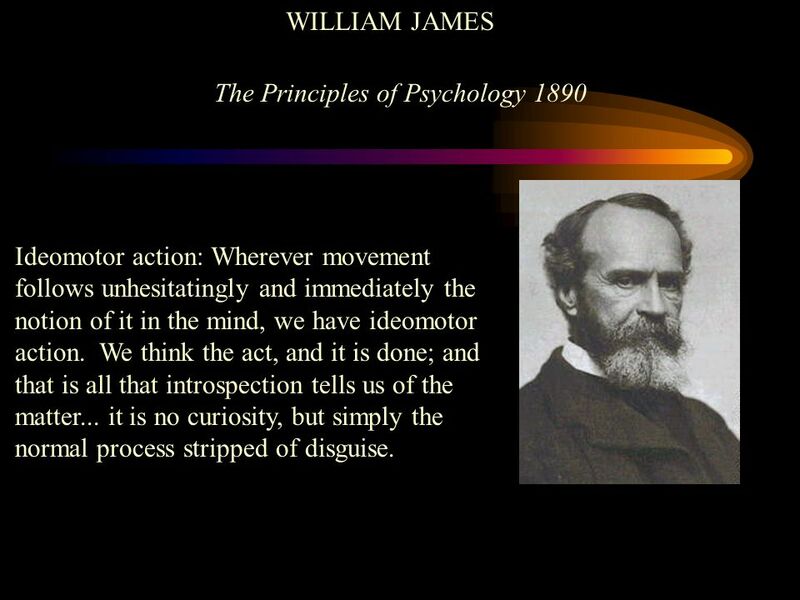 WILLIAM JAMES The Principles of Psychology 1890 Ideomotor action: Wherever movement follows unhesitatingly and immediately the notion of it in the mind, we have ideomotor action. 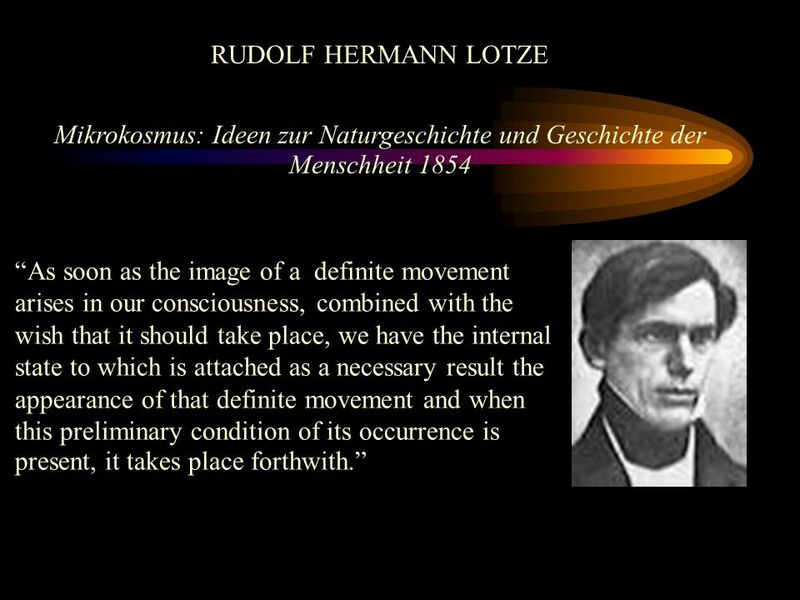 We think the act, and it is done; and that is all that introspection tells us of the matter... it is no curiosity, but simply the normal process stripped of disguise. 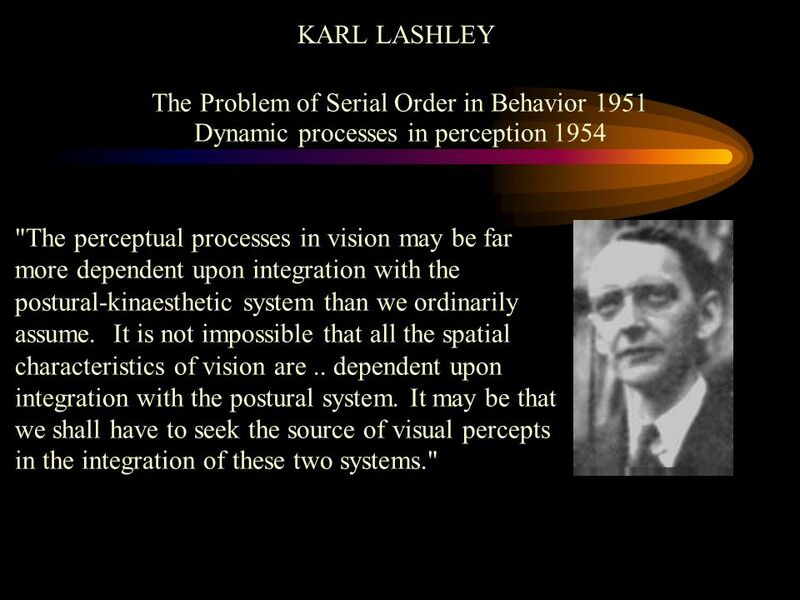 KARL LASHLEY The Problem of Serial Order in Behavior 1951 Dynamic processes in perception 1954 "The perceptual processes in vision may be far more dependent upon integration with the postural-kinaesthetic system than we ordinarily assume. 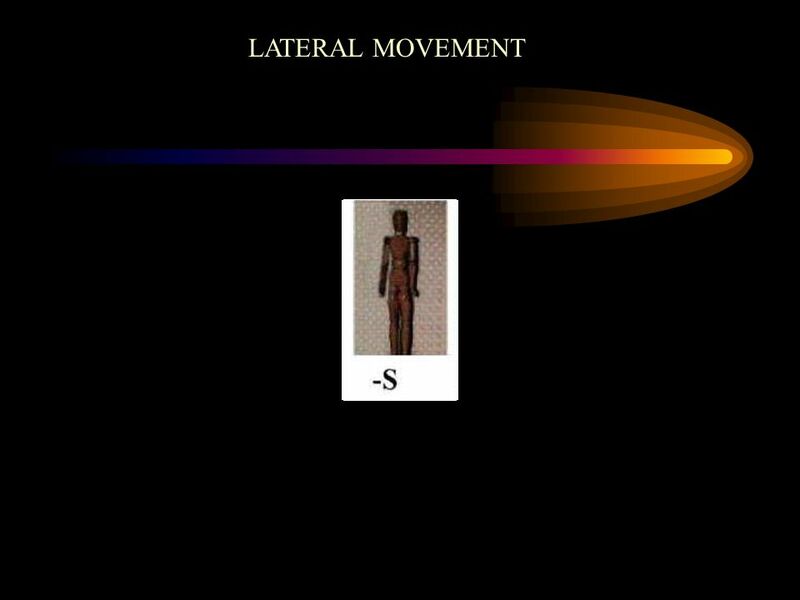 It is not impossible that all the spatial characteristics of vision are .. dependent upon integration with the postural system. 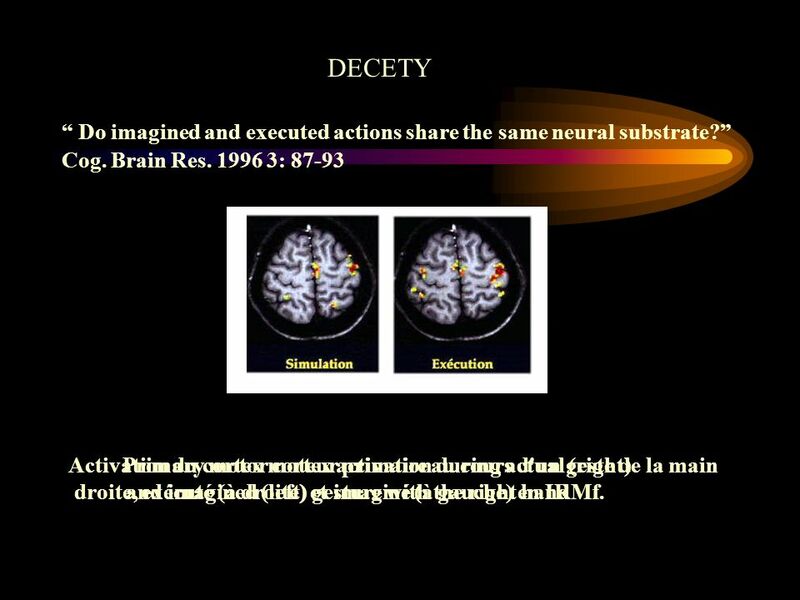 It may be that we shall have to seek the source of visual percepts in the integration of these two systems." 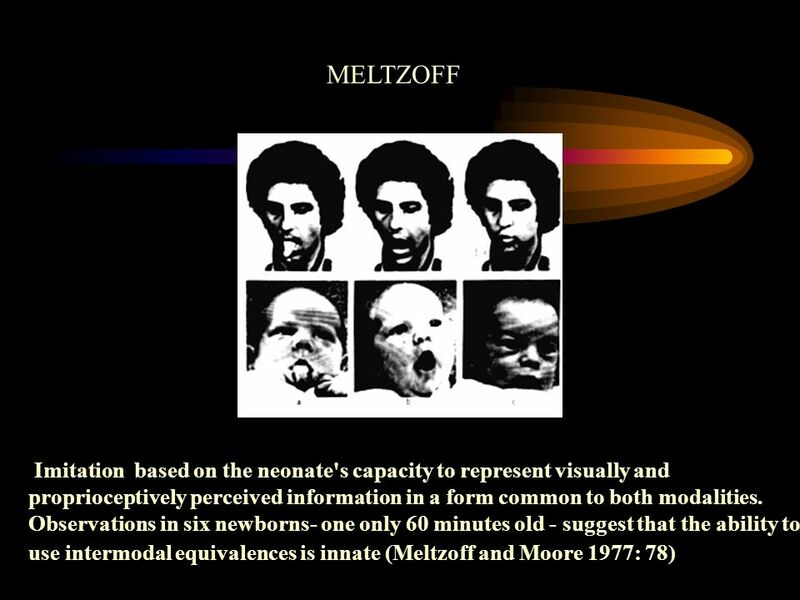 49 THE CHAMELEON THEORY The chameleon theory of speech/gesture perception proposes that changes in brain-patterning from seeing are translated into specific motor-patterning which, for example in the infant, produces the re-presentation of the adult facial movement (Meltzoff and Moore 1973). 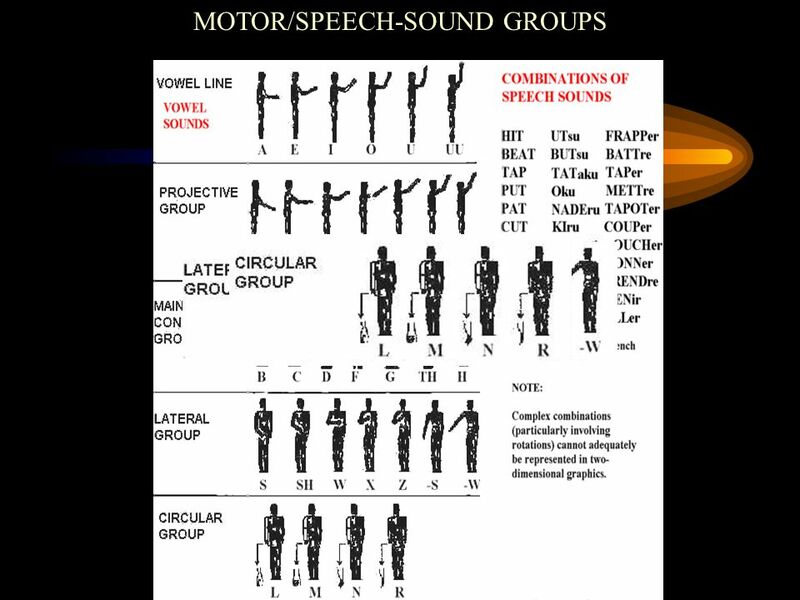 Similarly hearing speech produces in the hearer motor patterning equivalent to the motor patterning in the speaker (Liberman et al.) 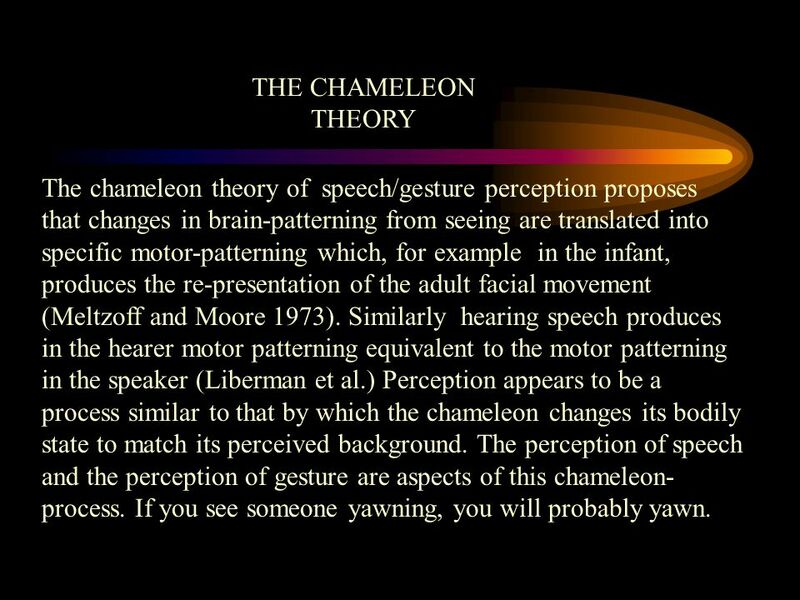 Perception appears to be a process similar to that by which the chameleon changes its bodily state to match its perceived background. 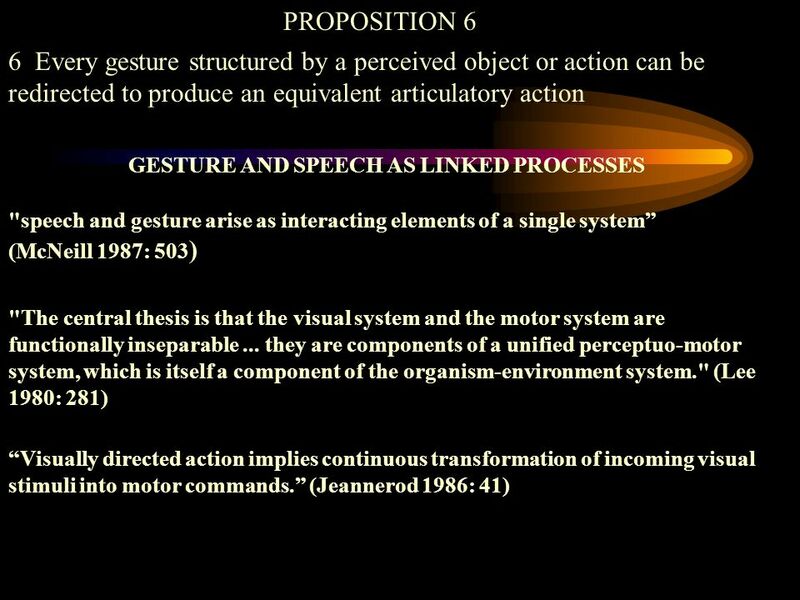 The perception of speech and the perception of gesture are aspects of this chameleon-process. If you see someone yawning, you will probably yawn. 52 The methodological formalisms of TGG theory are abandoned. 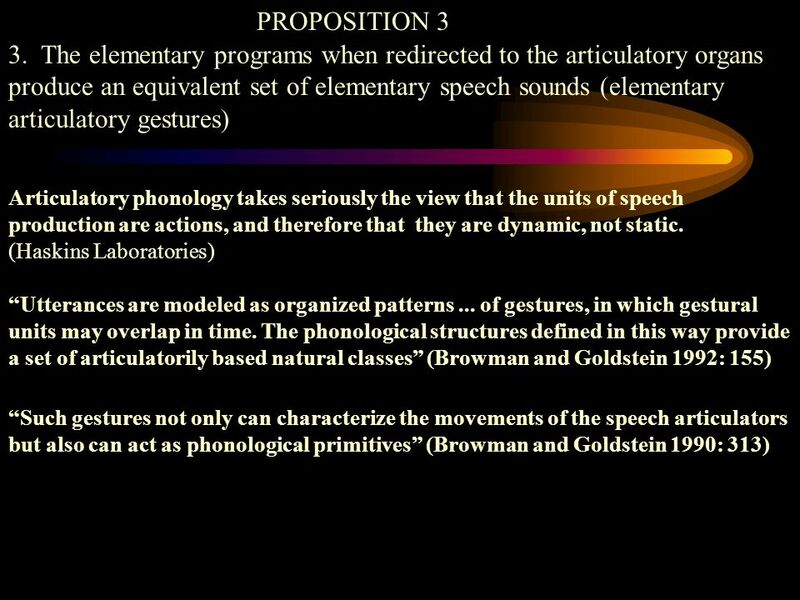 LINGUISTICS The methodological formalisms of TGG theory are abandoned. 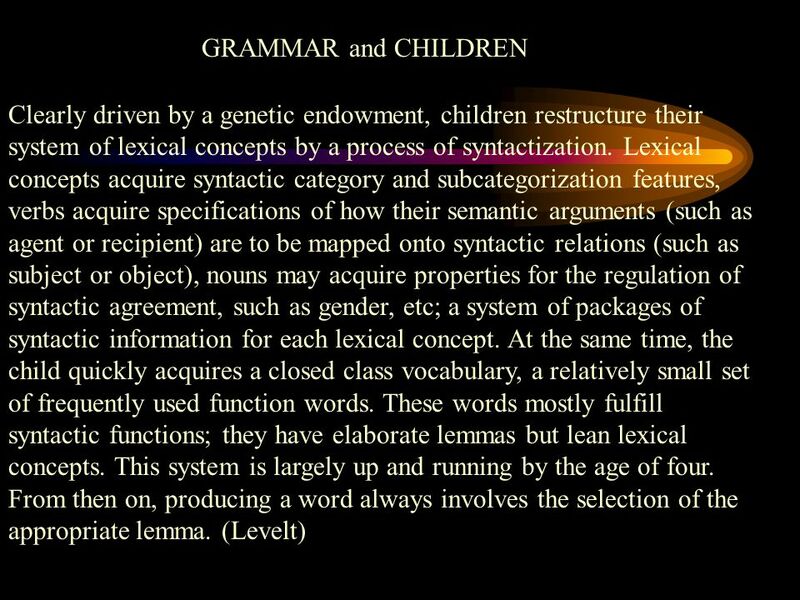 Deep Structure, Surface Structure and many other technicalities go The lexicon is the source of syntax. 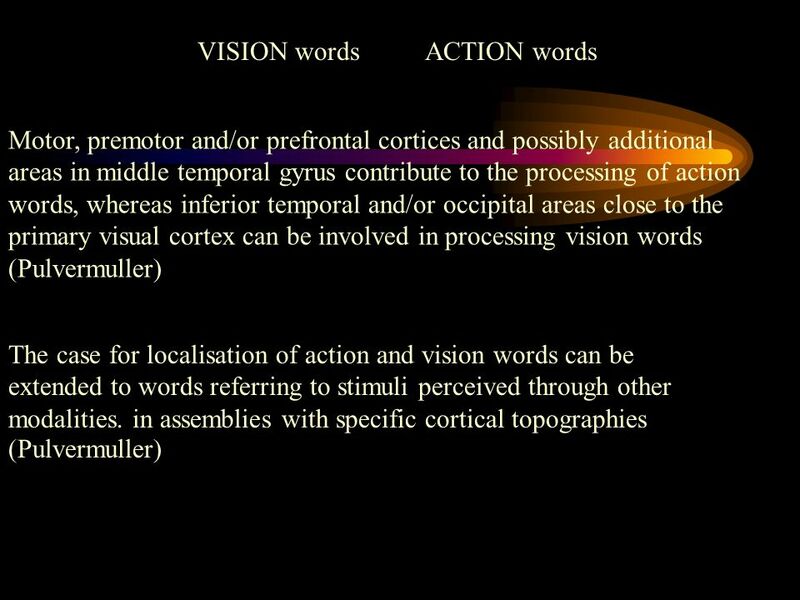 55 LEXICON IN THE BRAIN Different categories of words, content words, function words, vision words, action/motor words, are associated with topographically different patterns of excitation in the brain. Function words include prepositions, conjunctions, and demonstratives, together with morphemic subwords: the terminations of abstract nouns, verb and noun inflections, suffixes prefixes and infixes. The number of function words and subwords in any language is small, about 200 in English. 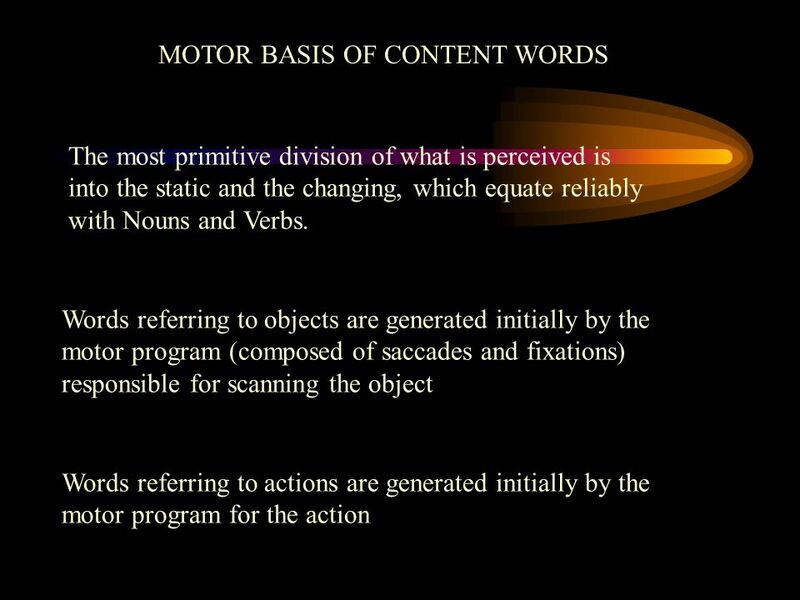 Content words include nouns, verbs, adjectives and adverbs. The class of content words is open, the number unlimited, about half-a-million so far in English. 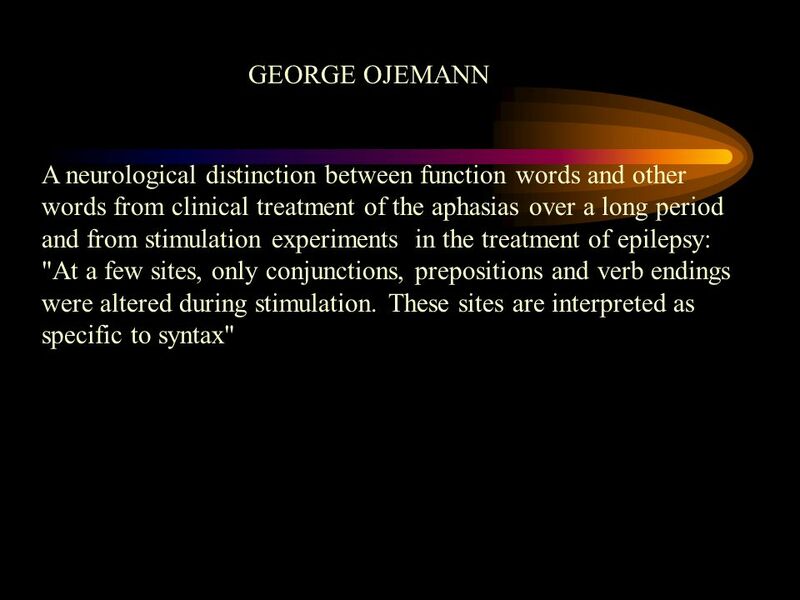 57 GEORGE OJEMANN A neurological distinction between function words and other words from clinical treatment of the aphasias over a long period and from stimulation experiments in the treatment of epilepsy: "At a few sites, only conjunctions, prepositions and verb endings were altered during stimulation. 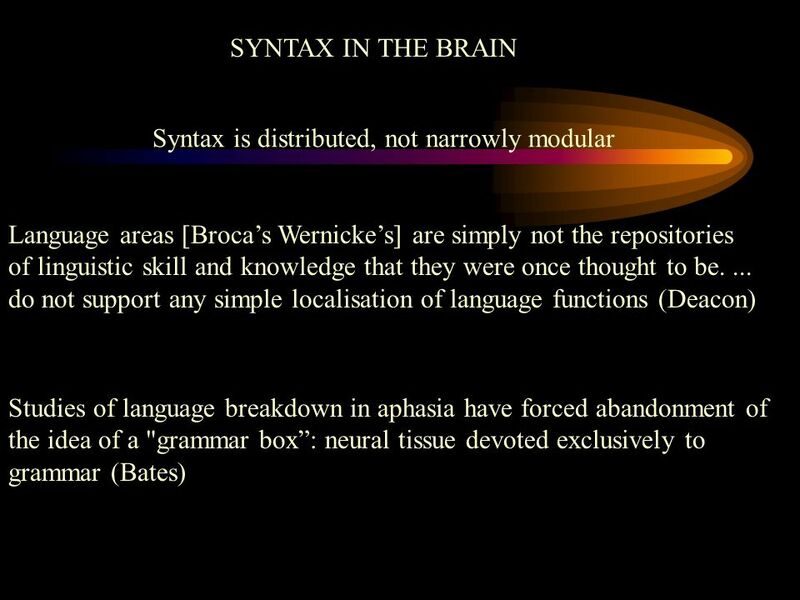 These sites are interpreted as specific to syntax"
58 Function words are strongly lateralized to the left hemisphere. 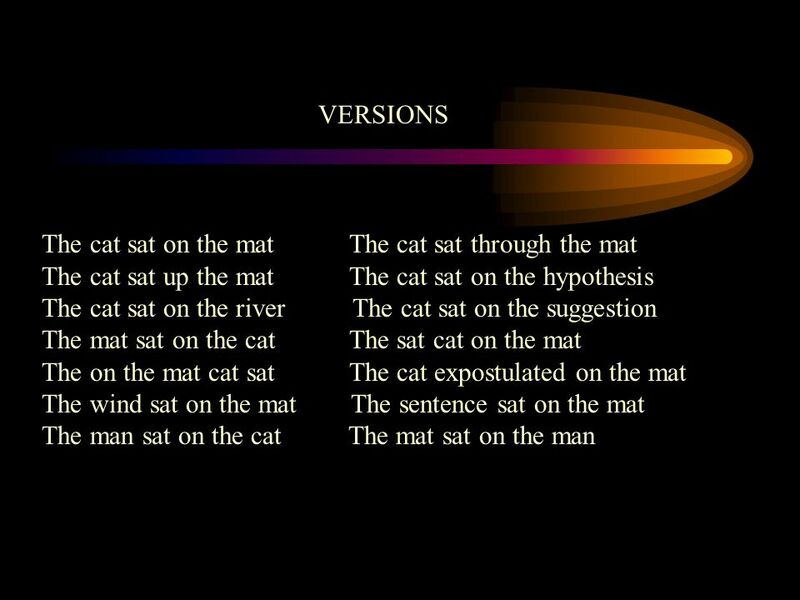 Content words are equally distributed over both hemispheres. 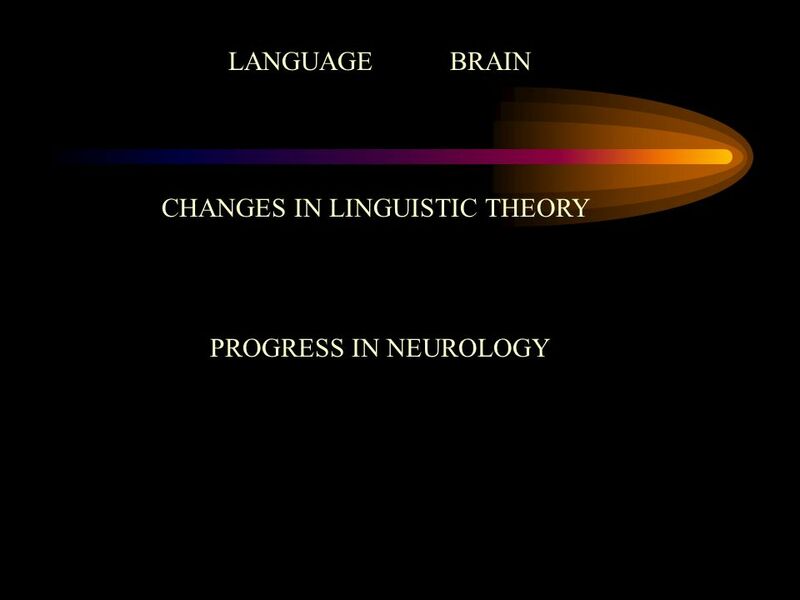 In languages with well-developed inflectional systems, aphasia may take the form of agrammatism. 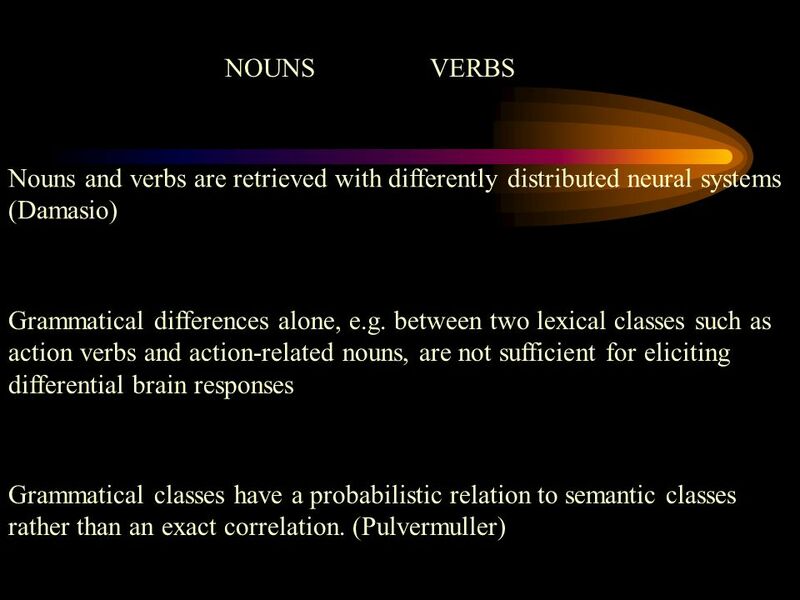 Nouns tend to appear only in the nominative case, verbs in the infinitive, auxiliary verbs and other words from closed classes are omitted. 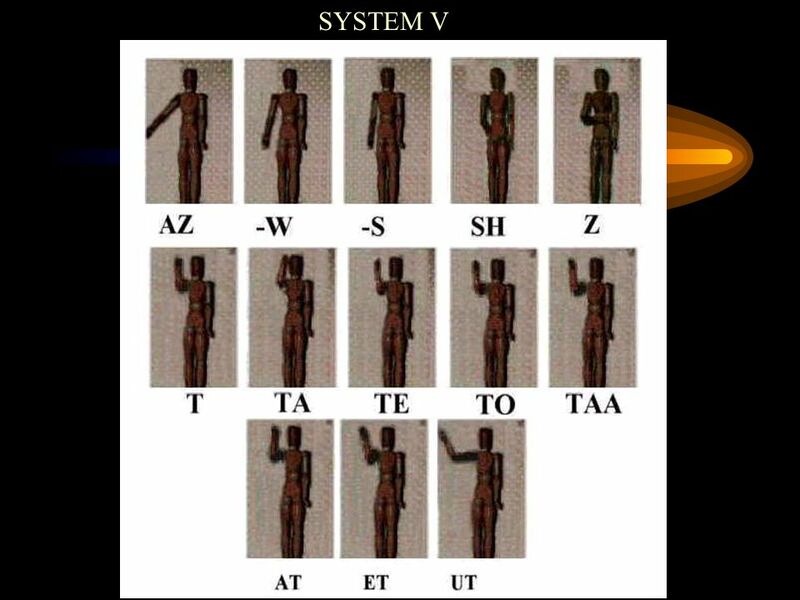 “H.T. was able to read 'four' but not 'for'; V.S. read 'sum' but not 'some'; and J.D. 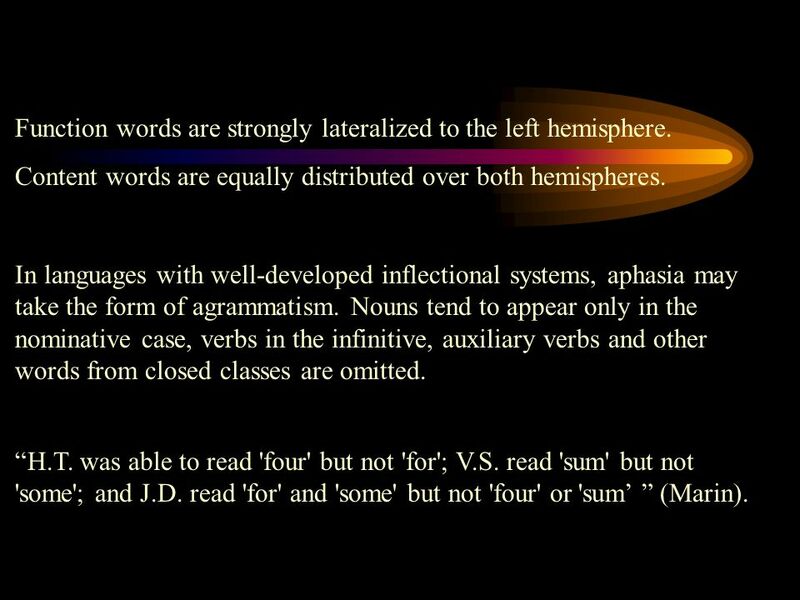 read 'for' and 'some' but not 'four' or 'sum’ ” (Marin). 65 SYNTAX The simplest, most obvious, definition of 'syntax' (returning to the Greek origin of syntax), is that it is the system by which words are put together in any language to convey meaning. 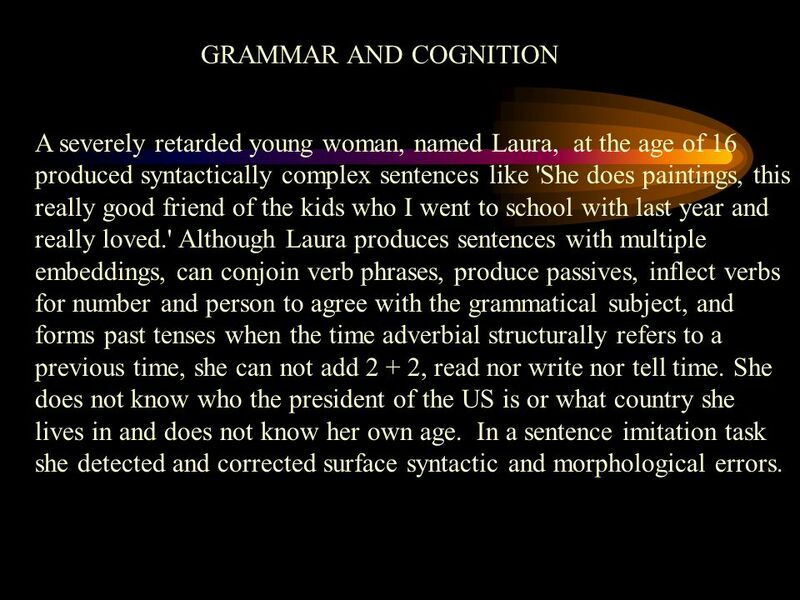 67 GRAMMAR AND COGNITION A severely retarded young woman, named Laura, at the age of 16 produced syntactically complex sentences like 'She does paintings, this really good friend of the kids who I went to school with last year and really loved.' 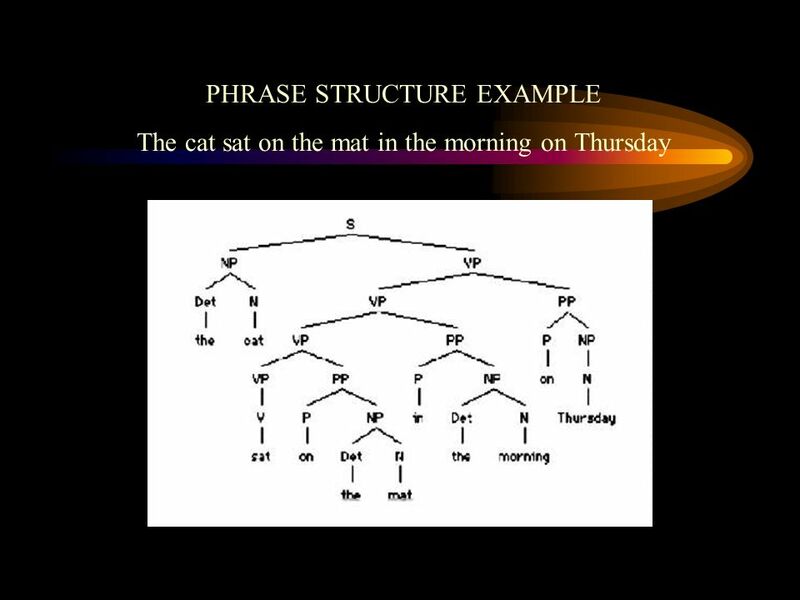 Although Laura produces sentences with multiple embeddings, can conjoin verb phrases, produce passives, inflect verbs for number and person to agree with the grammatical subject, and forms past tenses when the time adverbial structurally refers to a previous time, she can not add 2 + 2, read nor write nor tell time. She does not know who the president of the US is or what country she lives in and does not know her own age. 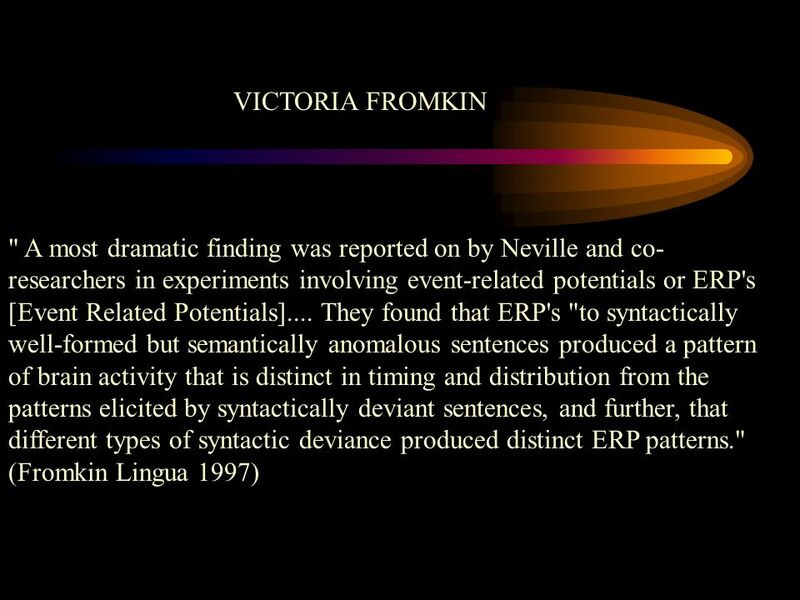 In a sentence imitation task she detected and corrected surface syntactic and morphological errors. 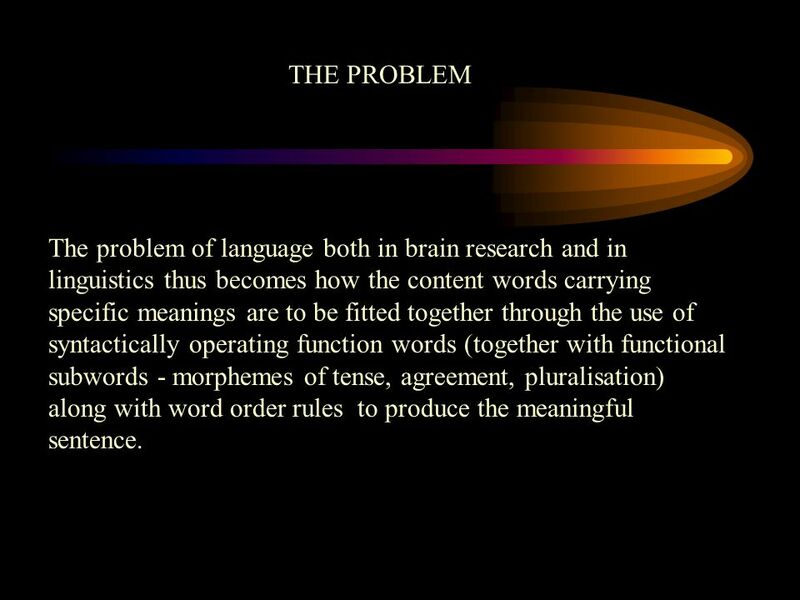 70 THE PROBLEM The problem of language both in brain research and in linguistics thus becomes how the content words carrying specific meanings are to be fitted together through the use of syntactically operating function words (together with functional subwords - morphemes of tense, agreement, pluralisation) along with word order rules to produce the meaningful sentence. 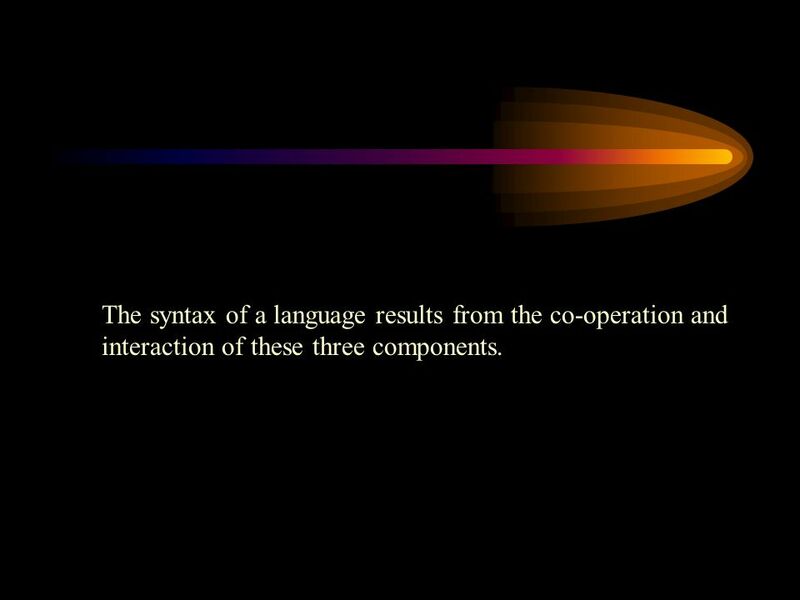 72 The syntax of a language results from the co-operation and interaction of these three components. 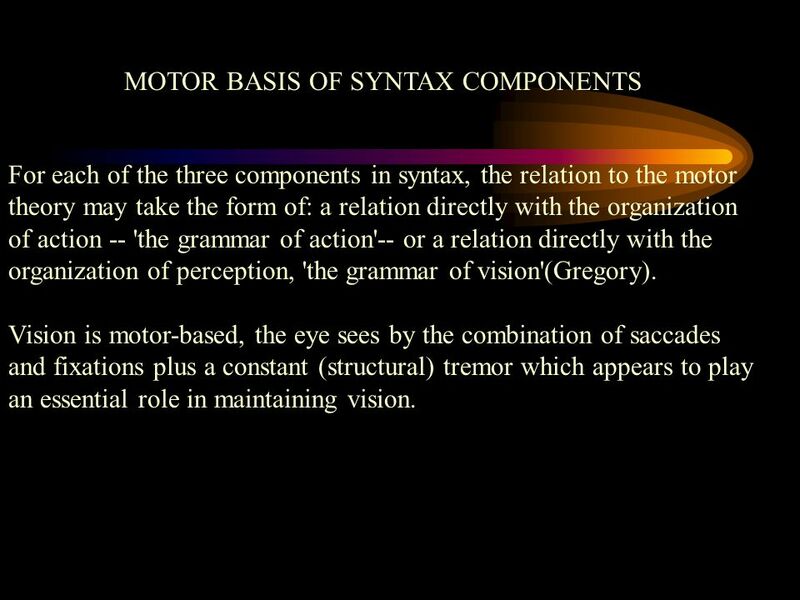 For each of the three components in syntax, the relation to the motor theory may take the form of: a relation directly with the organization of action -- 'the grammar of action'-- or a relation directly with the organization of perception, 'the grammar of vision'(Gregory). 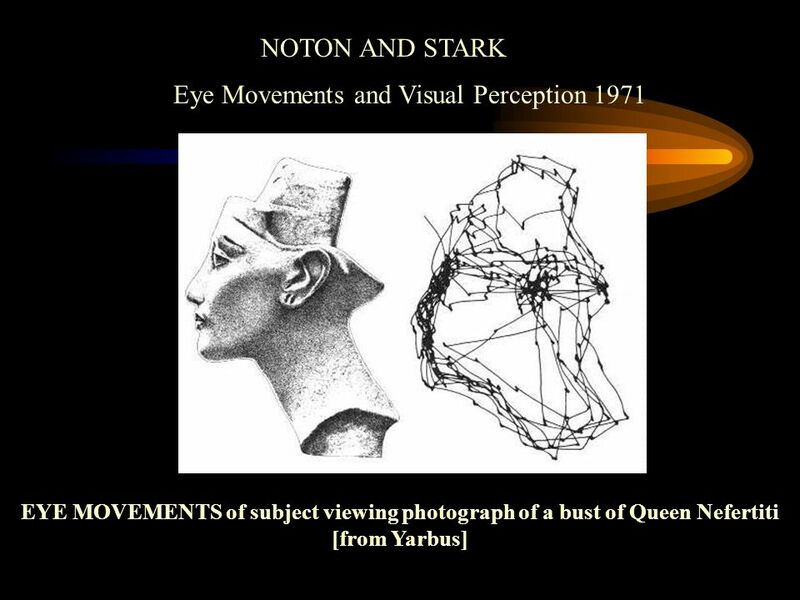 Vision is motor-based, the eye sees by the combination of saccades and fixations plus a constant (structural) tremor which appears to play an essential role in maintaining vision. 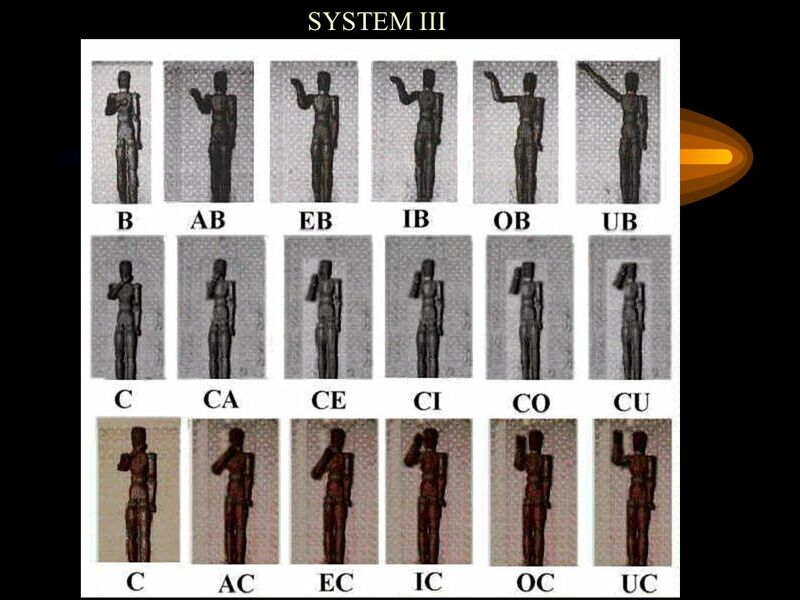 Scanning of a visual scene by the eye is a serial process, just as spoken language is a serial process. 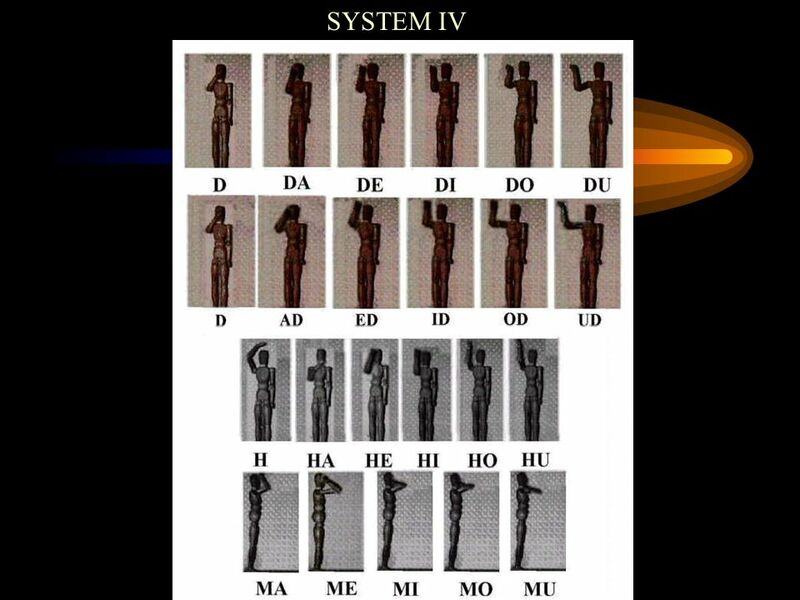 Bodily action is also serial; we stretch out our arm before we pick up a glass before we bring the glass towards us and then drink from it. 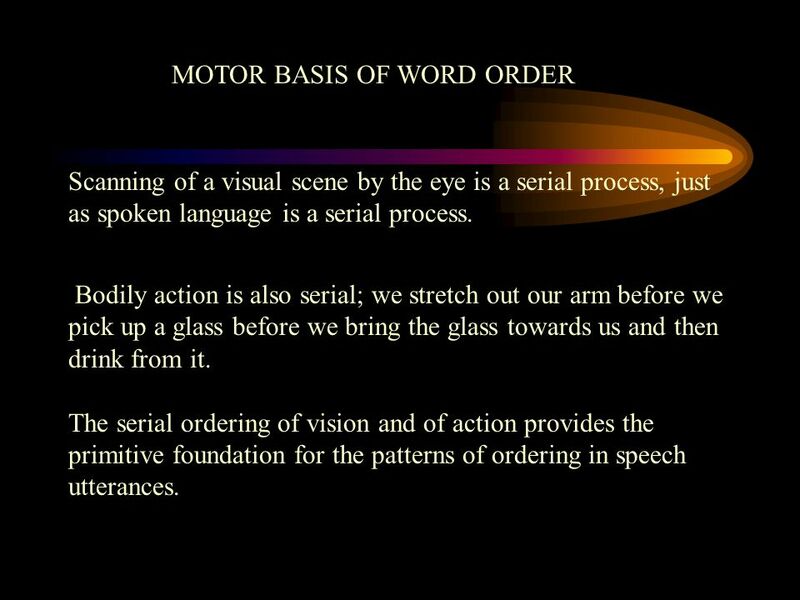 The serial ordering of vision and of action provides the primitive foundation for the patterns of ordering in speech utterances. 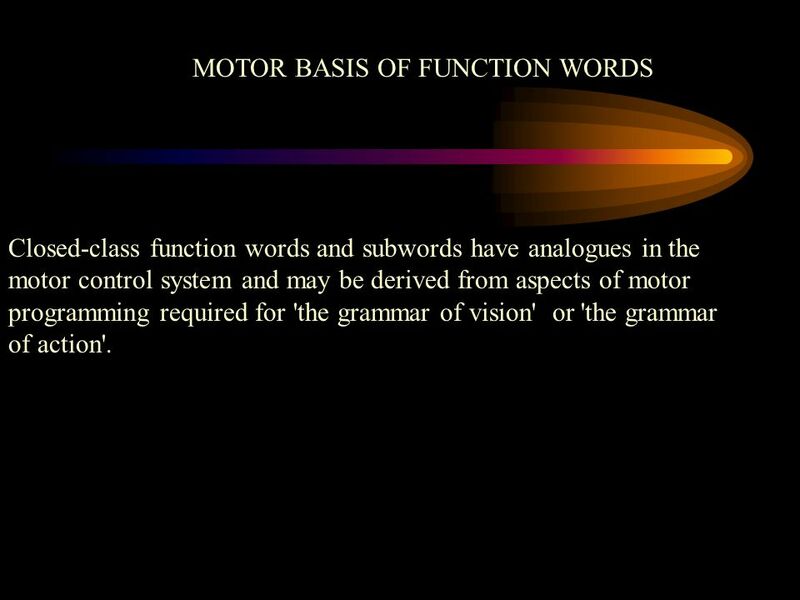 Closed-class function words and subwords have analogues in the motor control system and may be derived from aspects of motor programming required for 'the grammar of vision' or 'the grammar of action'. 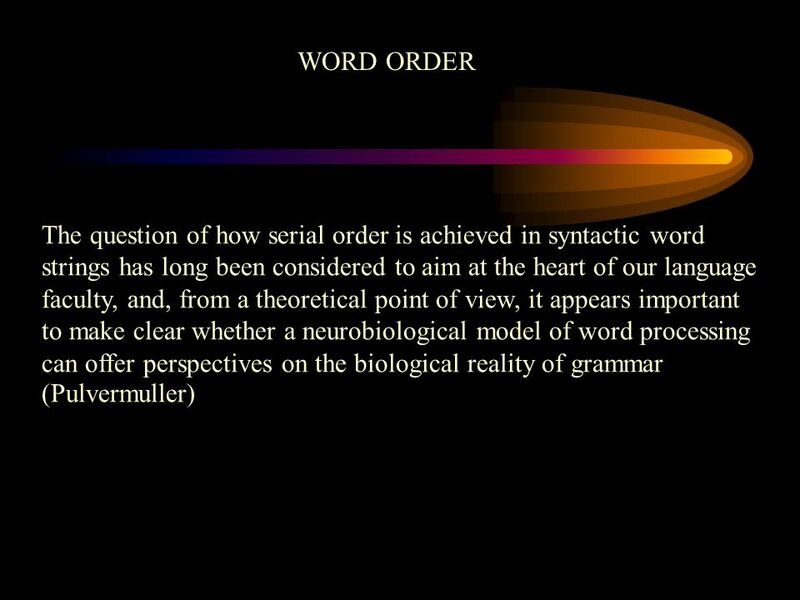 84 WORD ORDER AMBIGUITY 10 words drawn from a single language can be arranged in 3,628,000 ways. To arrive at the one semantically and syntactically right order, 3,627, 999 arrangements have to be judged deviant. 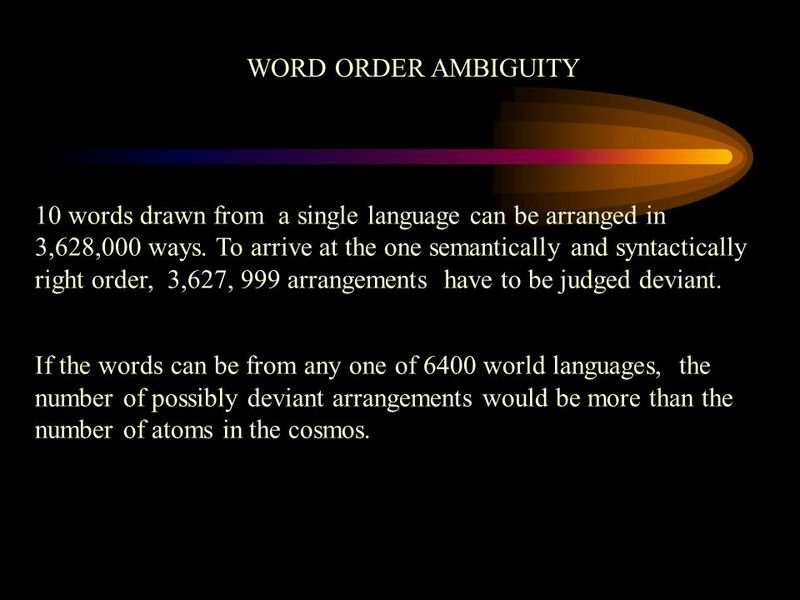 If the words can be from any one of 6400 world languages, the number of possibly deviant arrangements would be more than the number of atoms in the cosmos. 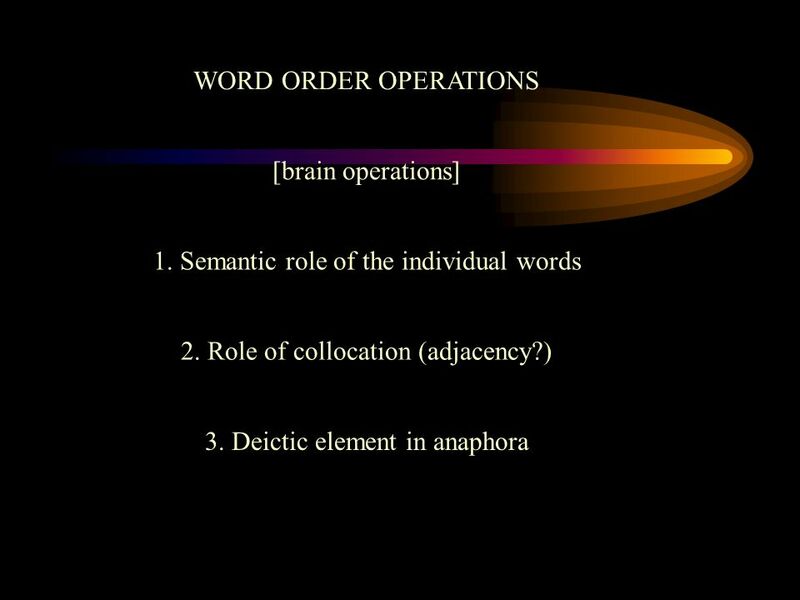 85 WORD ORDER? 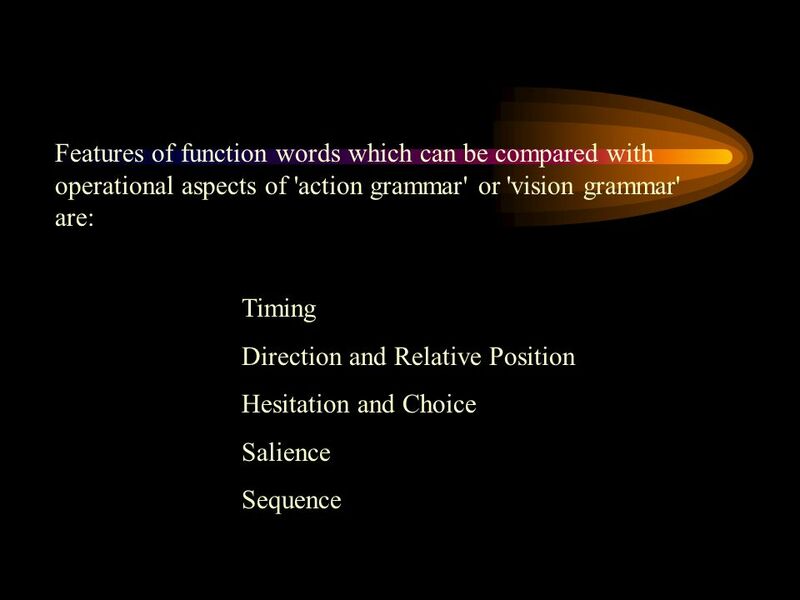 How do we know which of the arrangements of words makes sense and is grammatically possible? The phrase structure can only be constructed if we already know the meaning of the words, the meaning of the sentence and the inter-relation of the words. 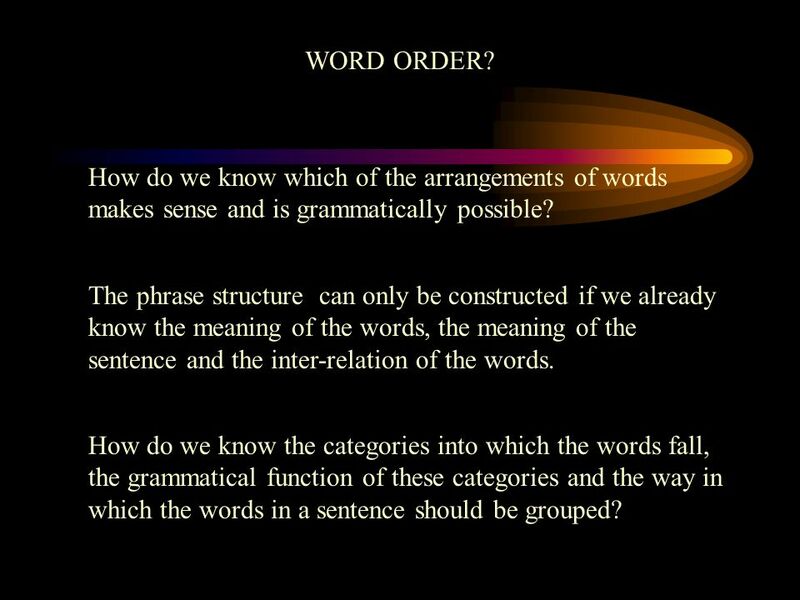 How do we know the categories into which the words fall, the grammatical function of these categories and the way in which the words in a sentence should be grouped? 87 THE SYNTAX PROCESS The role of syntax in the total process by which the individual translates his experience into words and uses them to transmit the content of his experience to another individual might be formulated as follows: - The starting point for any particular use of language, an utterance or a written sentence, the situation from which the word-string derives, is a perception or an action of the individual. - At its simplest the content of the perception, what is perceived, is the relationship of elements in the visual scene. The simplest perception consists of a number of elements in the perceived scene together with their relation to one another e.g. a cow is standing near a tree. 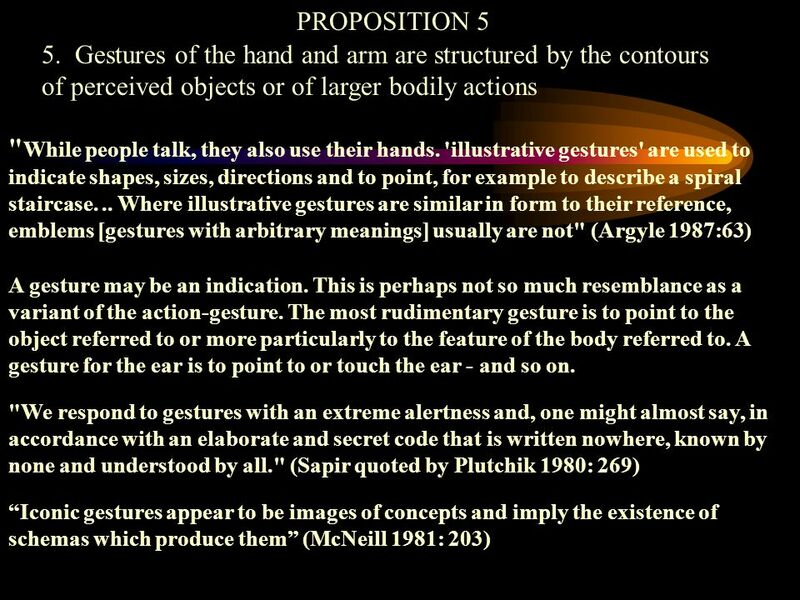 88 - These meaningful elements constitute the minimum semantic elements which will be taken into the utterance (or sentence) which describes the scene. - The relation existing between the elements in the scene is transferred to constitute the relation between the elements in the word string which describe the visual scene. - In terms of neural patterning, the precursor of the utterance is a compact form of the semantic elements derived from the perceived scene - This compact non-syntactic form has to be converted from a simultaneous patterning into the serial form required for the normal use of language. 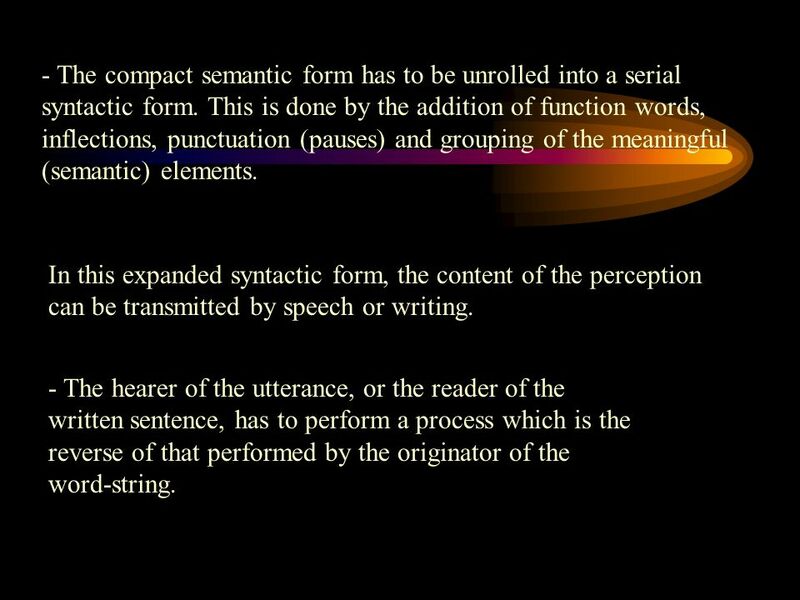 89 - The compact semantic form has to be unrolled into a serial syntactic form. This is done by the addition of function words, inflections, punctuation (pauses) and grouping of the meaningful (semantic) elements. 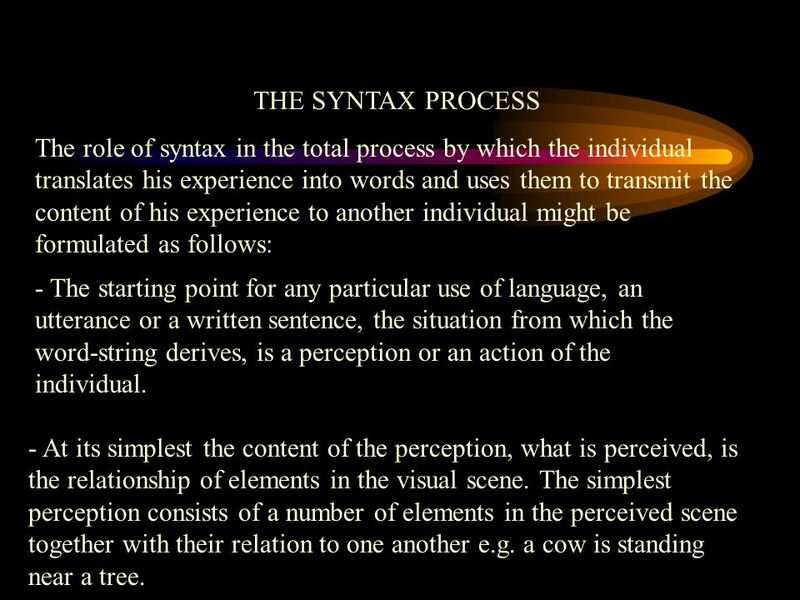 In this expanded syntactic form, the content of the perception can be transmitted by speech or writing. - The hearer of the utterance, or the reader of the written sentence, has to perform a process which is the reverse of that performed by the originator of the word-string. 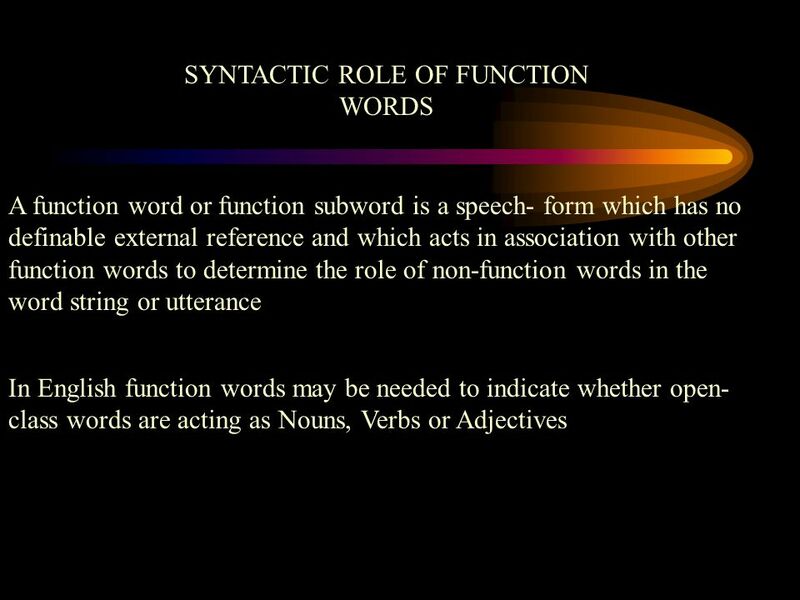 90 - The expanded syntactic form has to be stripped of function-words, inflections etc. 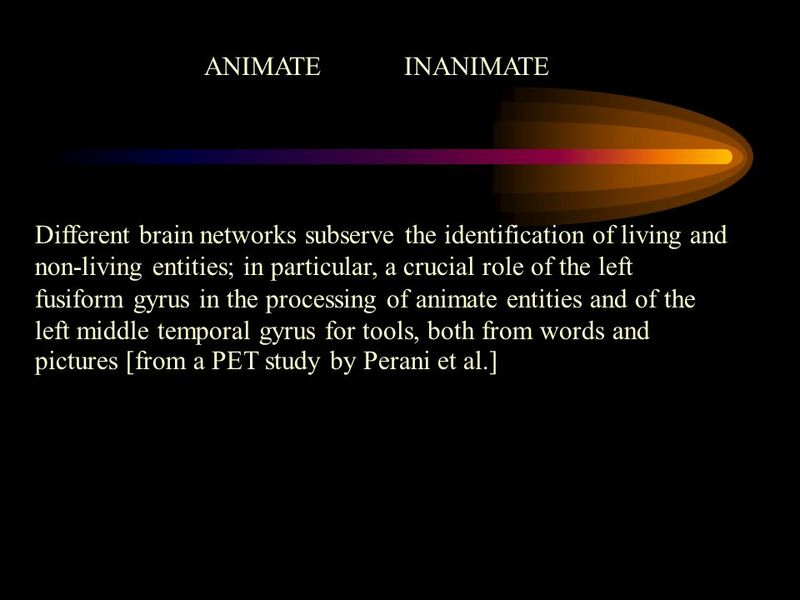 However, as they disappear, these syntactic elements guide the manner in which the content words, the semantic elements, are to be related in neural patterning. 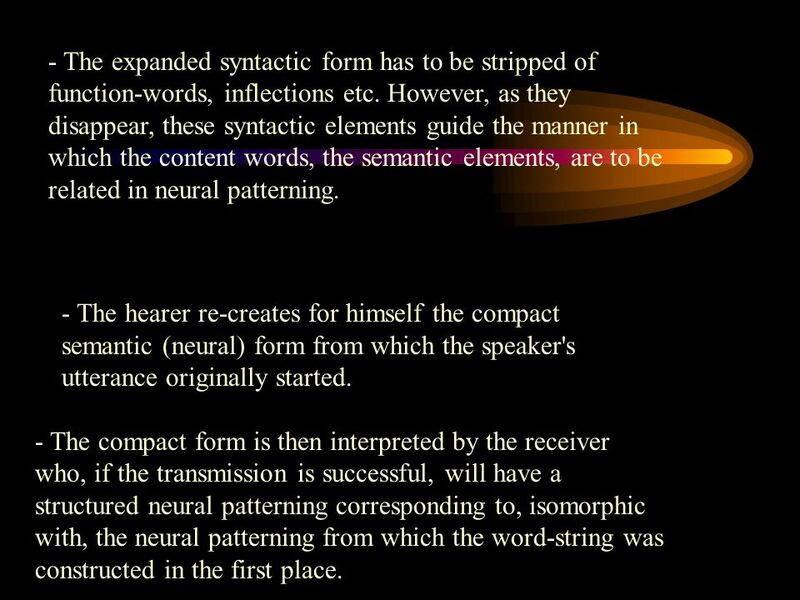 - The hearer re-creates for himself the compact semantic (neural) form from which the speaker's utterance originally started. - The compact form is then interpreted by the receiver who, if the transmission is successful, will have a structured neural patterning corresponding to, isomorphic with, the neural patterning from which the word-string was constructed in the first place. 91 - The transmitted patterning is interpreted by the receiver in much the same way as would be a perception originating within the receiver himself. 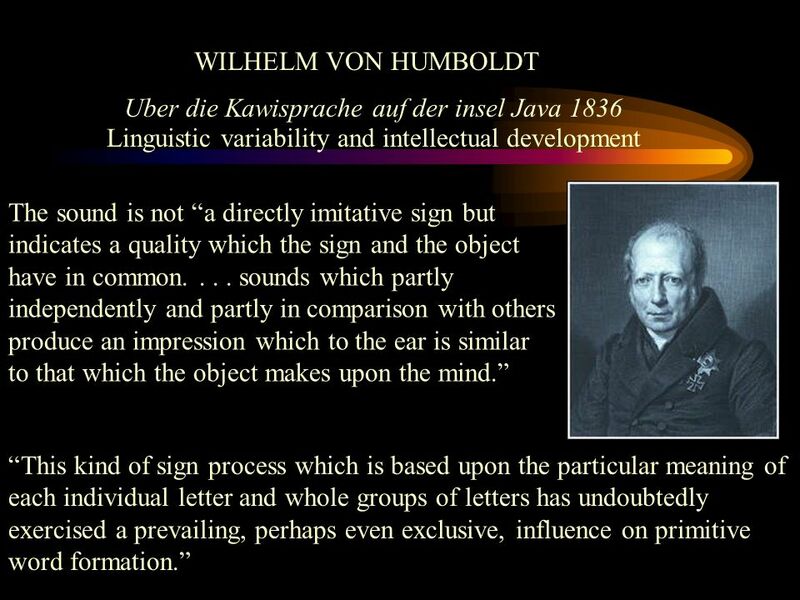 92 MOTOR SYNTAX ß ß SPEECH SYNTAX ? 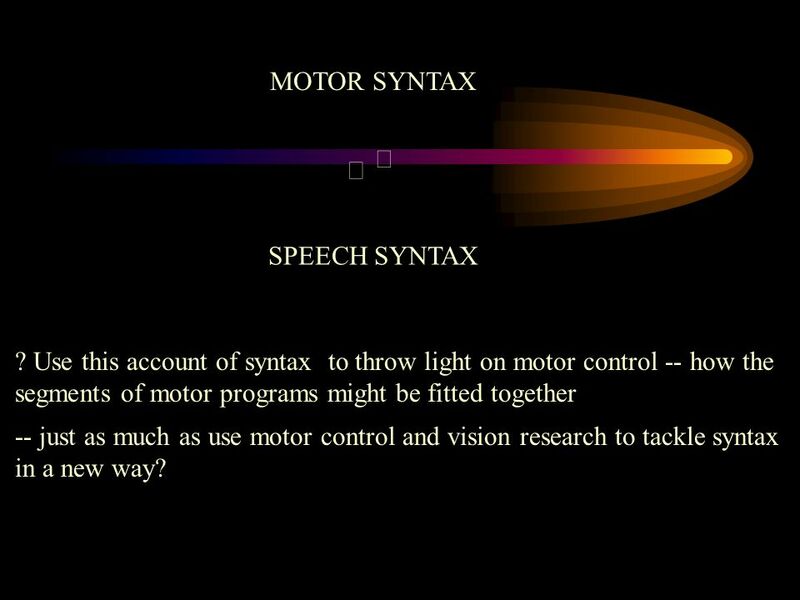 Use this account of syntax to throw light on motor control -- how the segments of motor programs might be fitted together -- just as much as use motor control and vision research to tackle syntax in a new way? Download ppt "Language Origins Society 2000 Rutgers University N.J."
European Society for the Study of Cognitive Systems London 2005 THE CHILD AND THE WORLD Robin Allott. 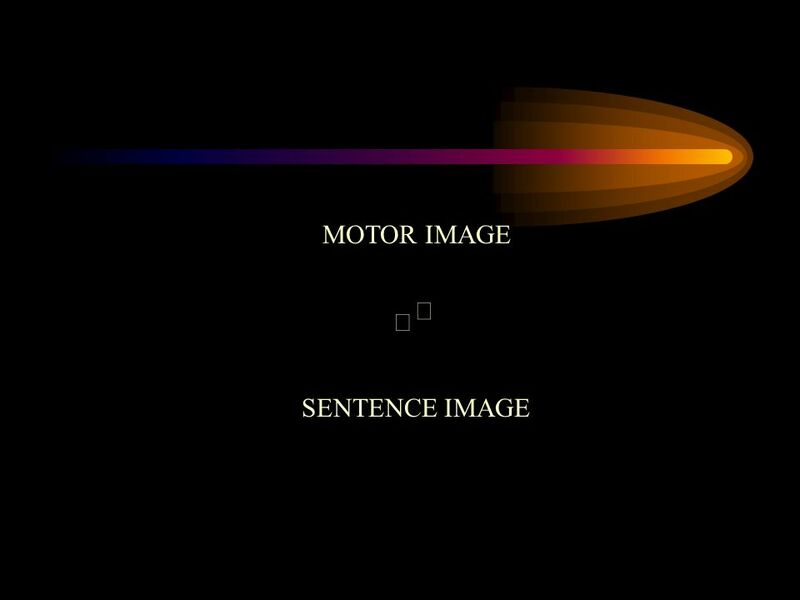 MOTOR EQUIVALENCE The central element of the motor theory of language. 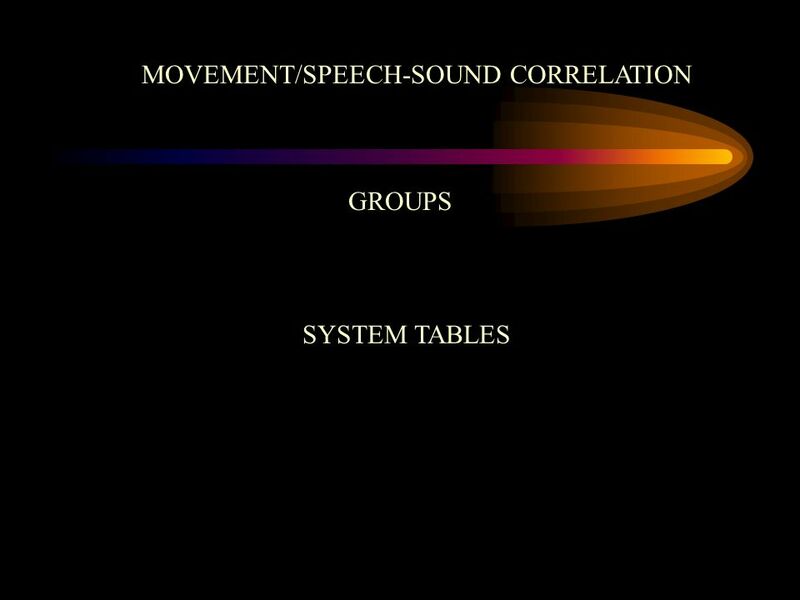 Gesture and speech are controlled by the same system Maurizio Gentilucci Dipartimento di Neuroscienze, Università di Parma, Italy RTM (Rete Multidisciplinare. 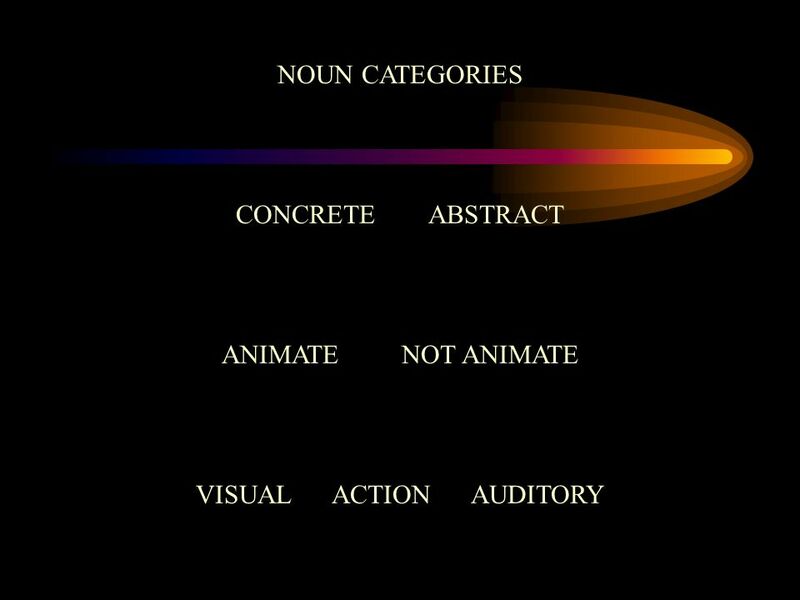 Grammar: Meaning and Contexts * From Presentation at NCTE annual conference in Pittsburgh, 2005. Language and Cognition Colombo, June 2011 Day 8 Aphasia: disorders of comprehension. 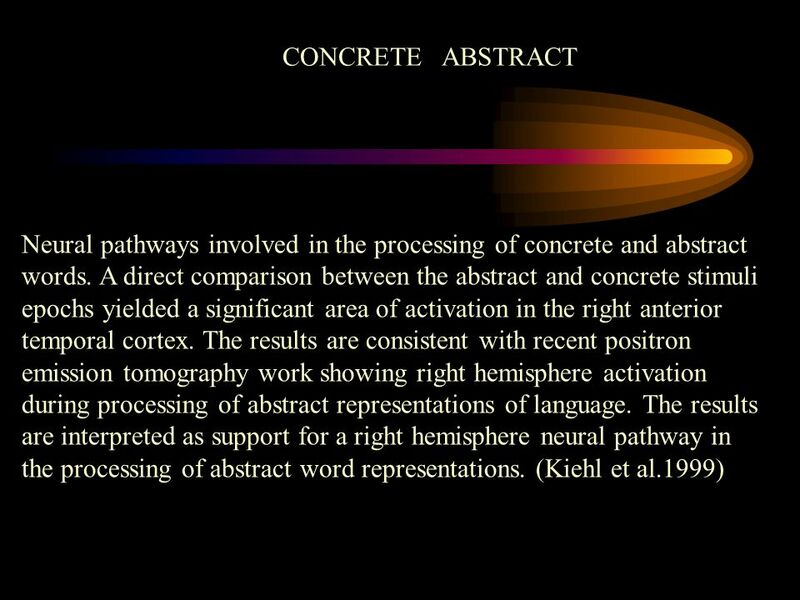 © 2001 Laura Snodgrass, Ph.D.1 Language Psycholinguistics –study of mental processes and structures that underlie our ability to produce and comprehend. 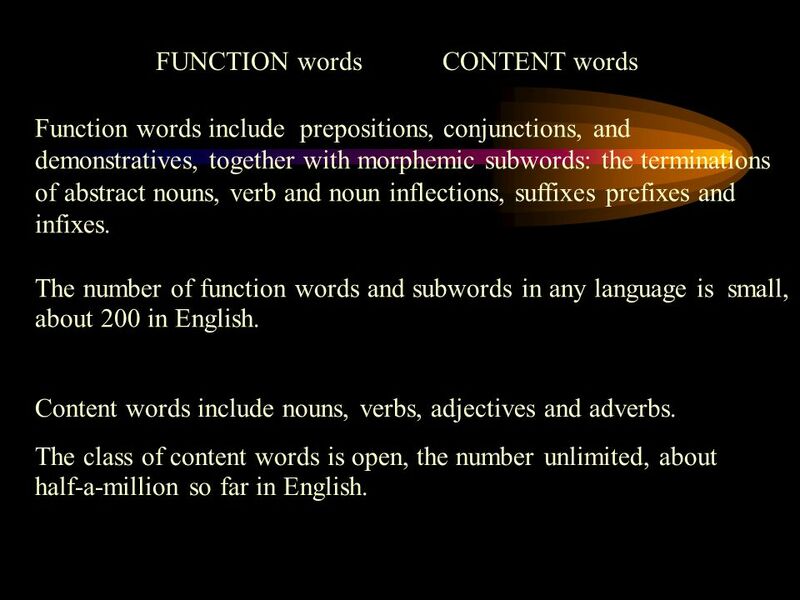 MORPHOLOGY - morphemes are the building blocks that make up words. Perception. Perception; is a complex cognitive process that is concerned with selection, organization and interpretation of stimuli. Perception involves. 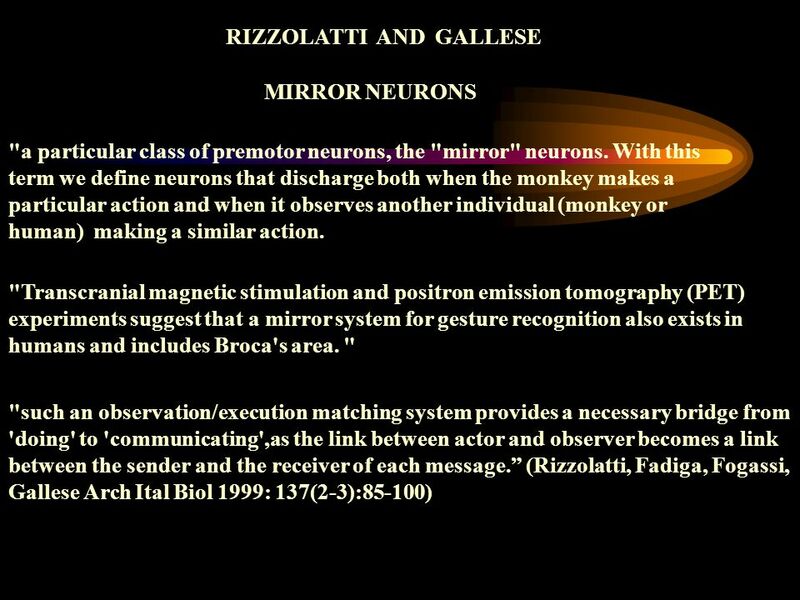 Language within our grasp: Gesture, mirror neurons, and meaning.